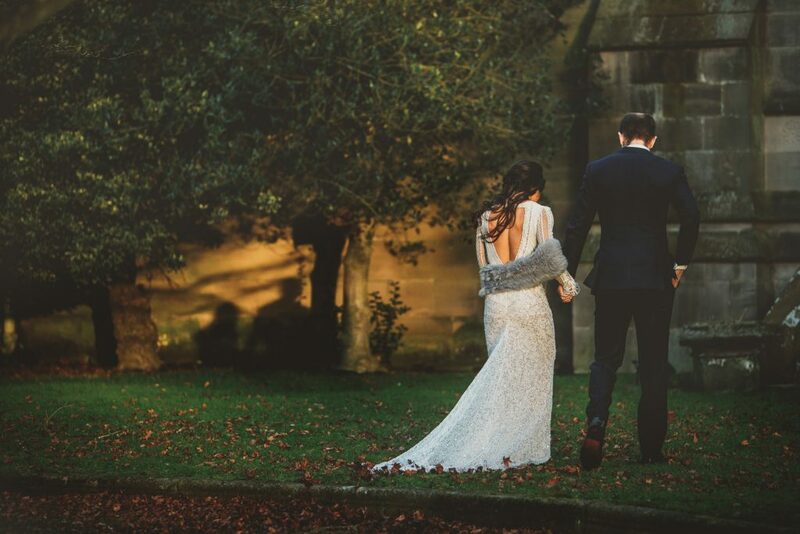 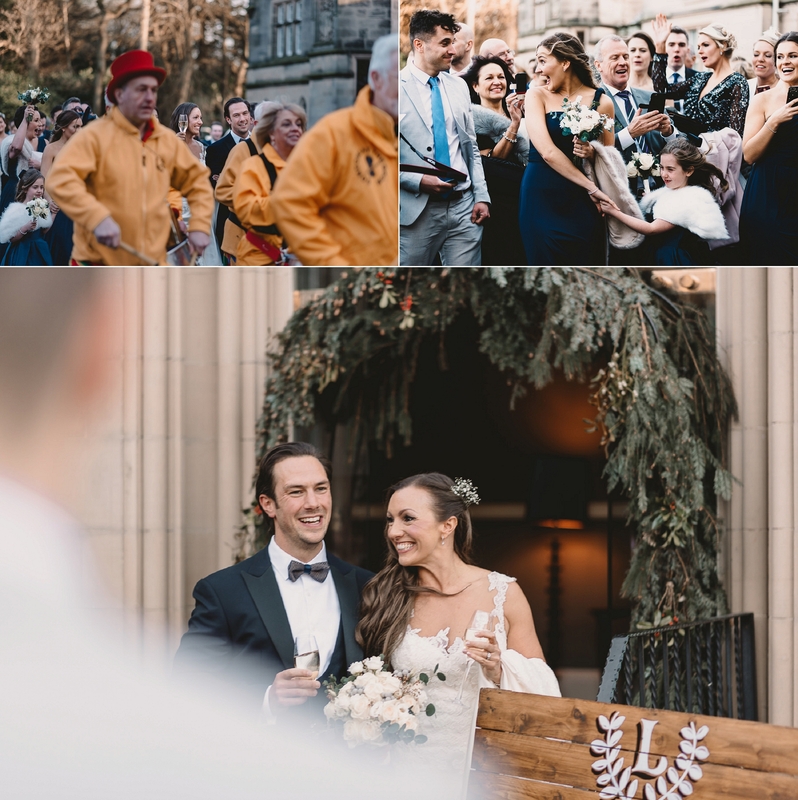 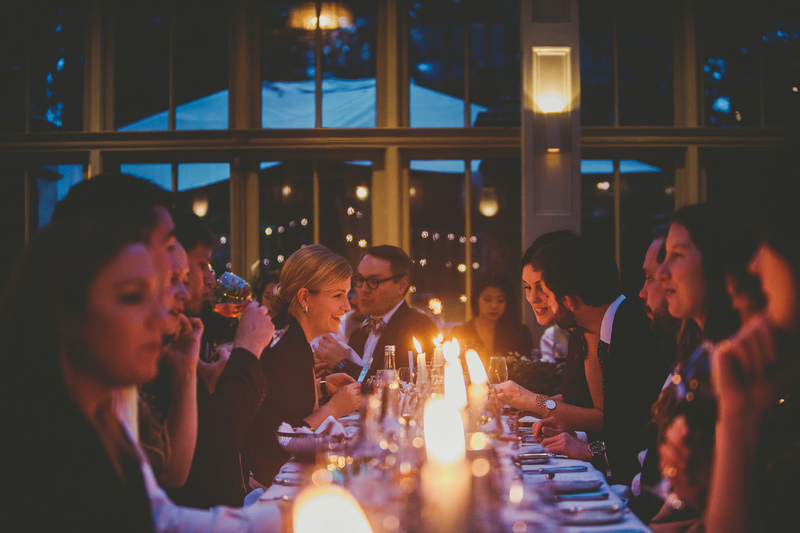 This winter has been an epic one for us, just perfect as we do love winter weddings. 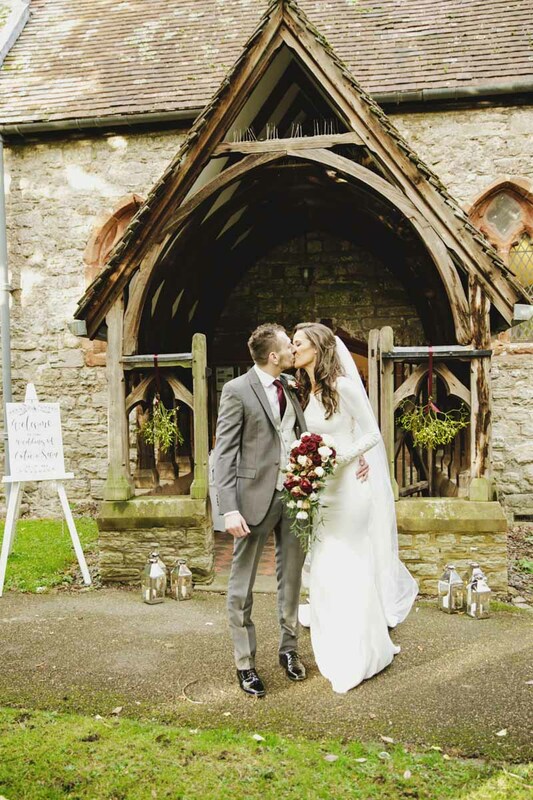 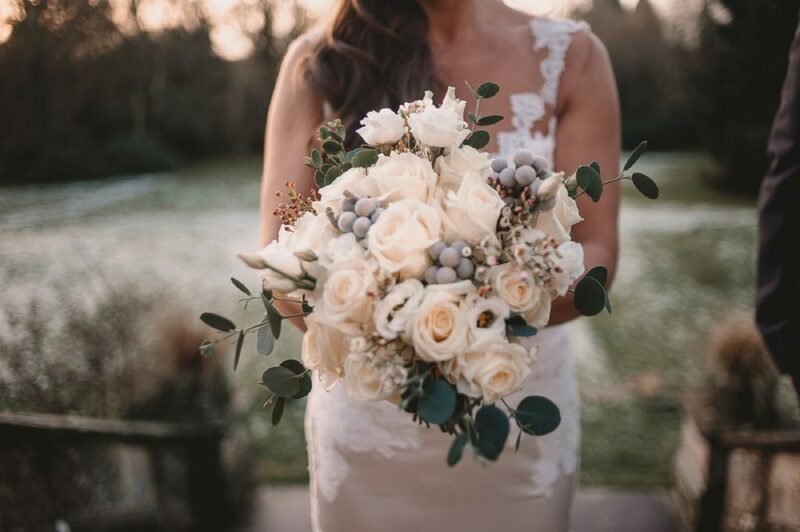 Hannah chose a white and grey bridal bouquet for her Winter Wedding at Hampton Manor. 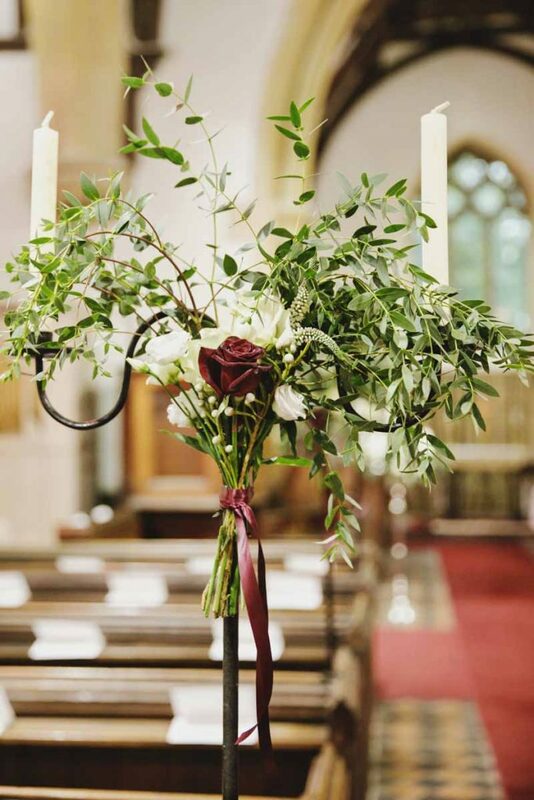 This organic mix of roses, lisianthus, wax flower, grey brunia and eucalyptus looked stunning with her bridal gown. 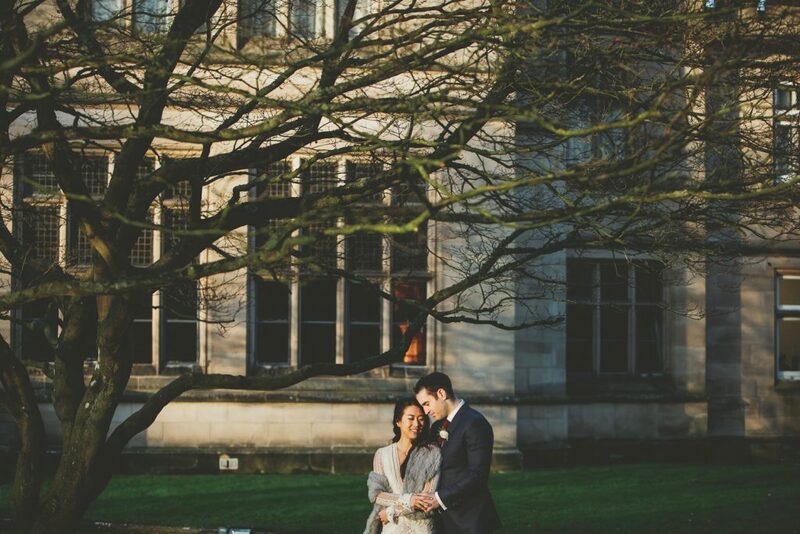 This makes all the early mornings worthwhile. 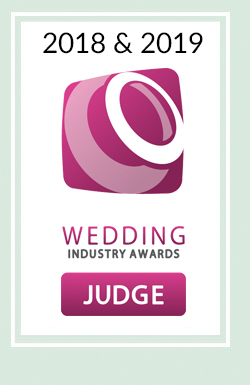 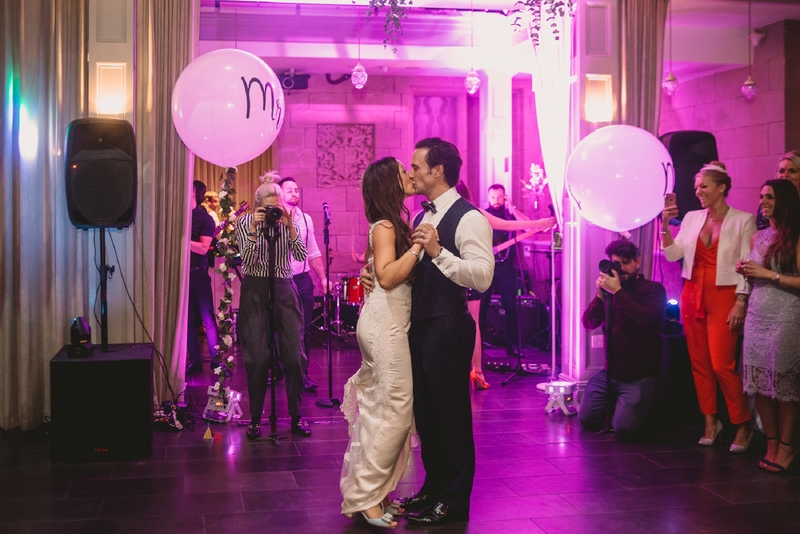 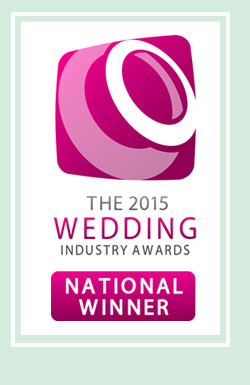 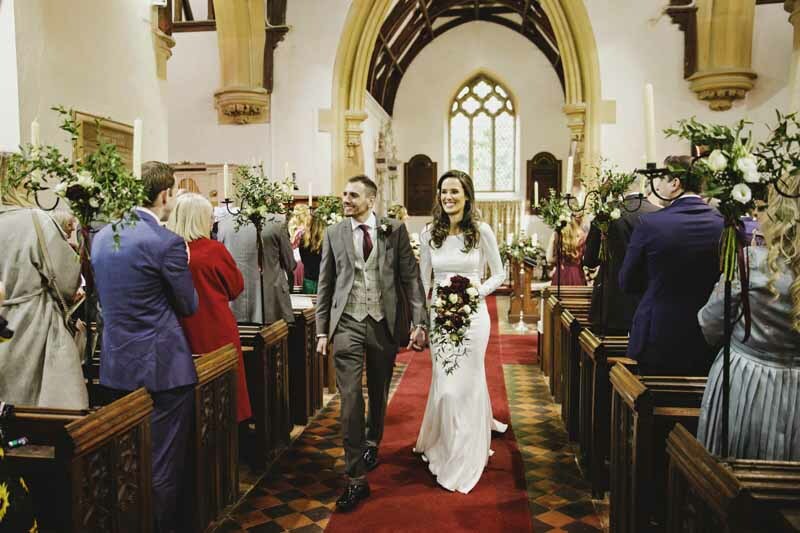 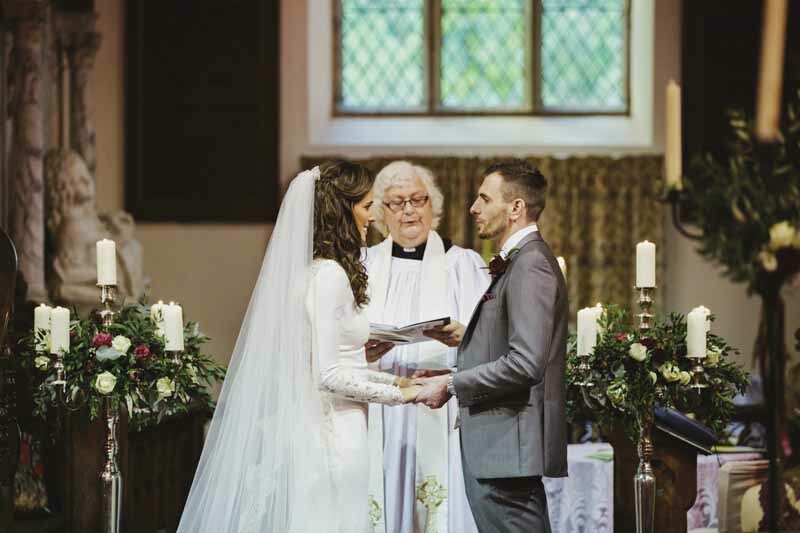 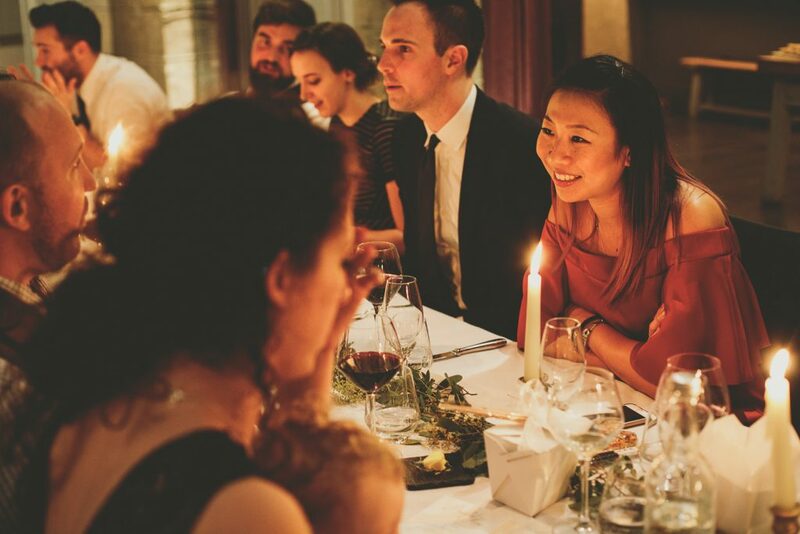 If you are looking for inspiration for your winter wedding please get in touch. 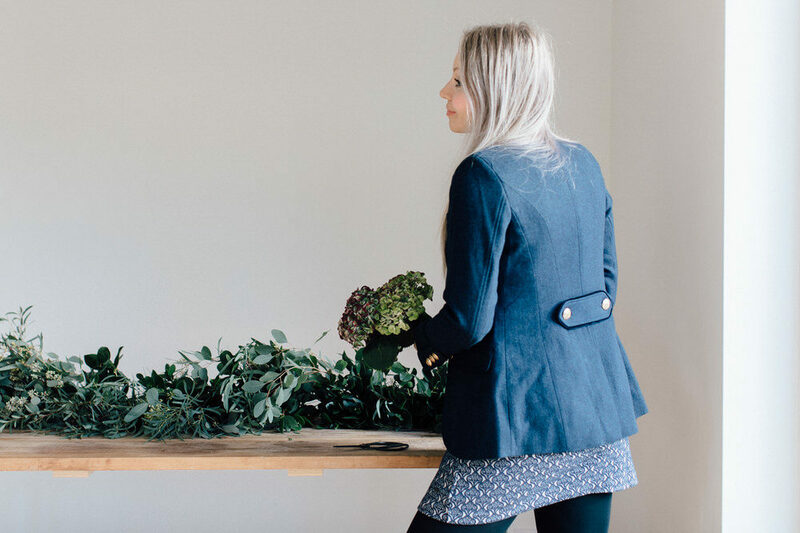 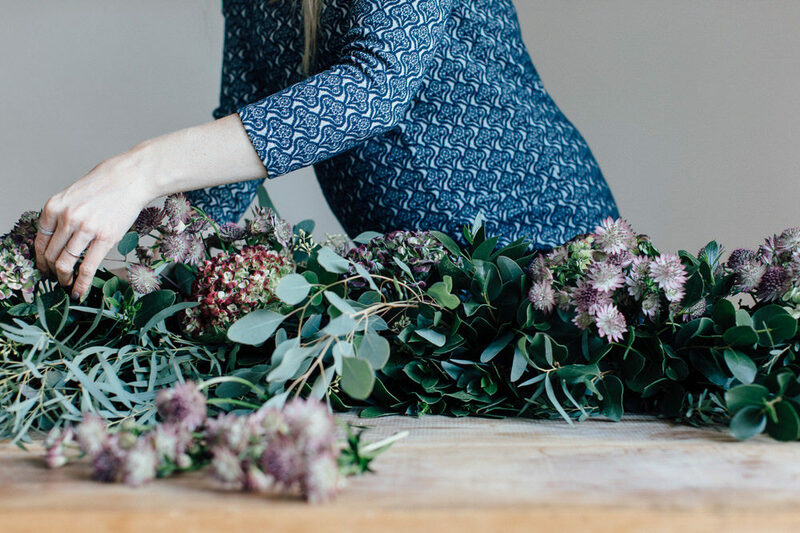 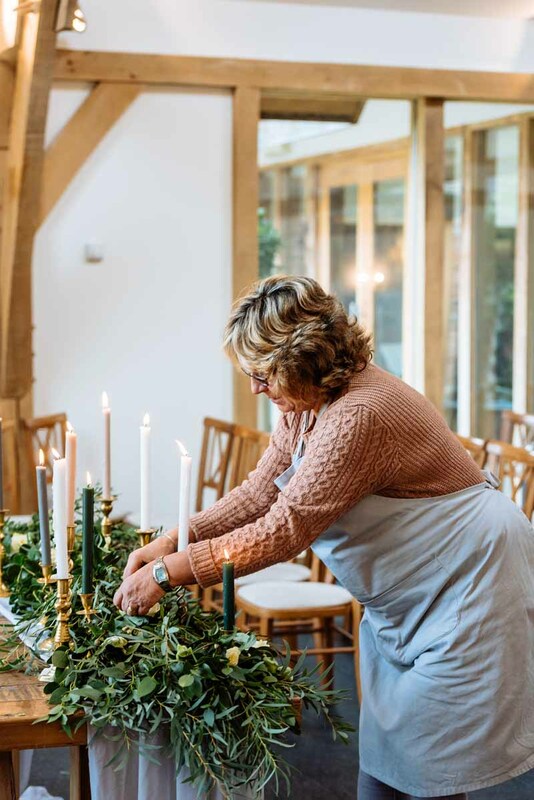 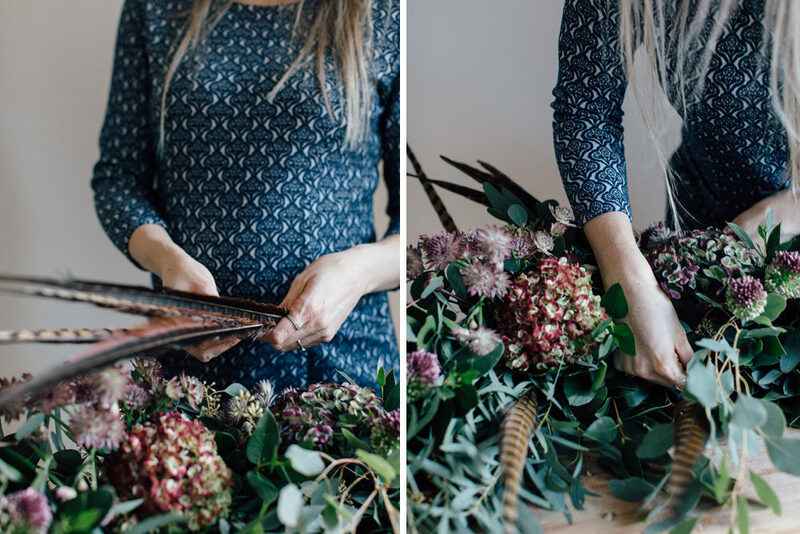 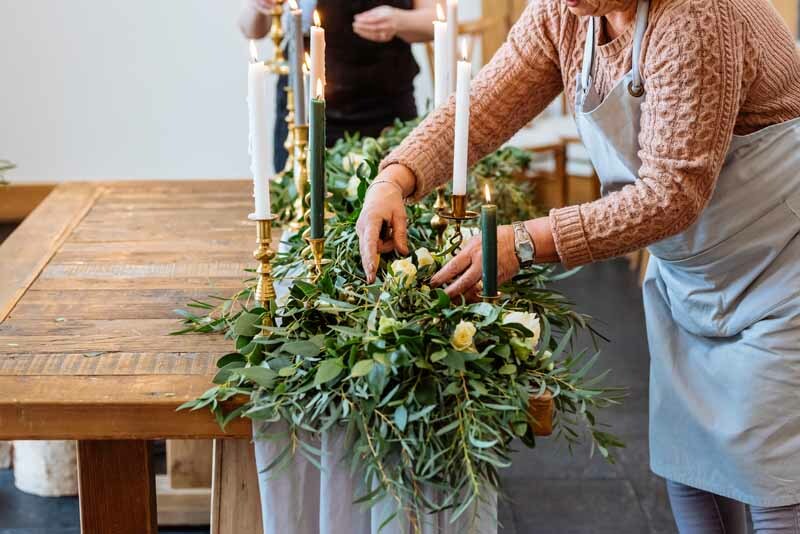 Join Passion for Flowers on one of our Christmas wreath making workshops. 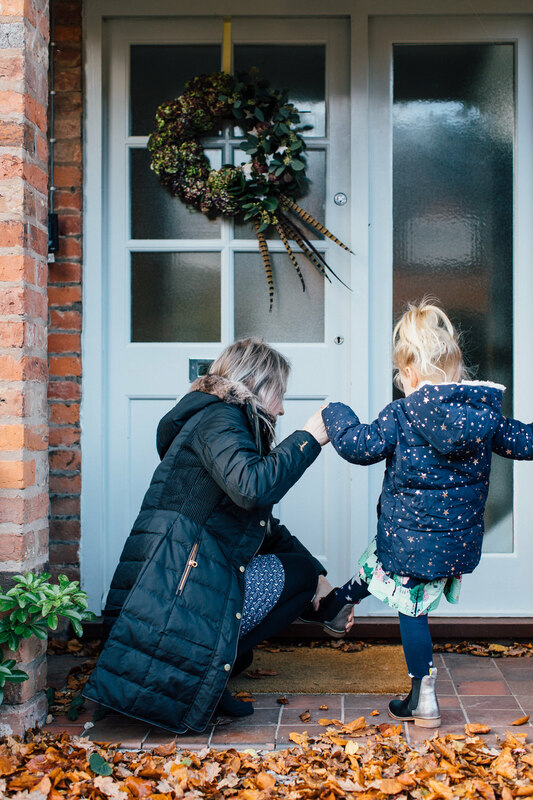 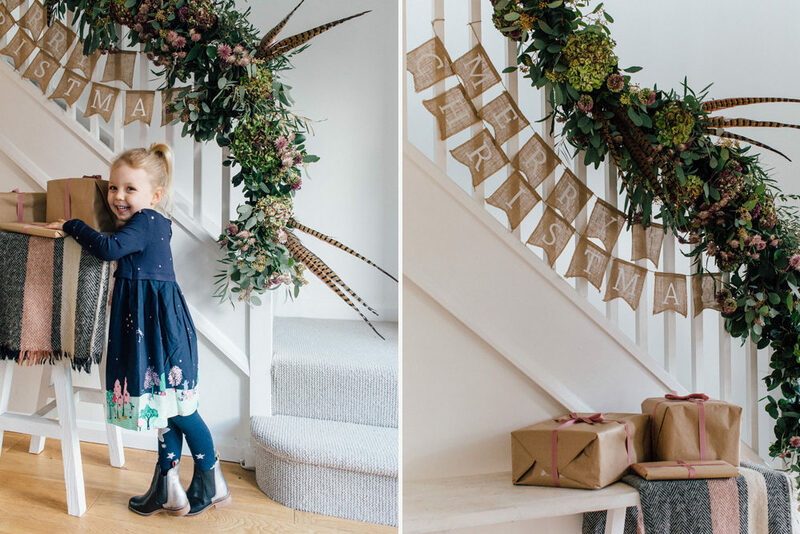 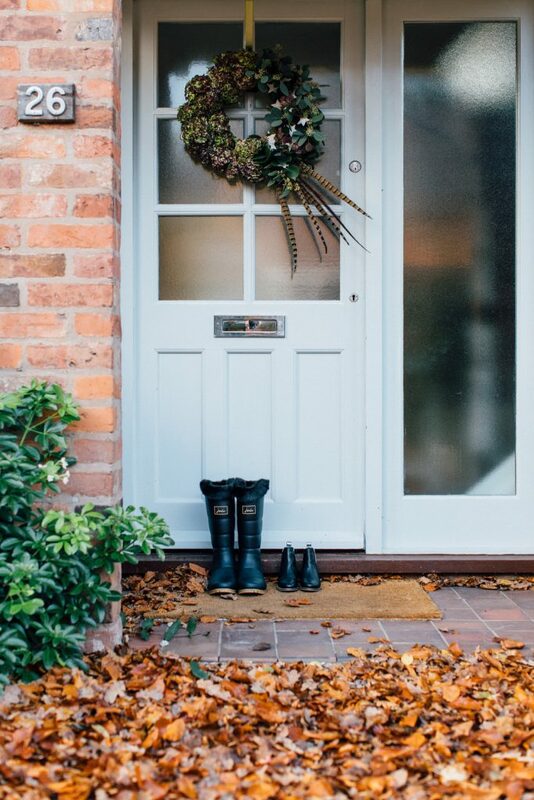 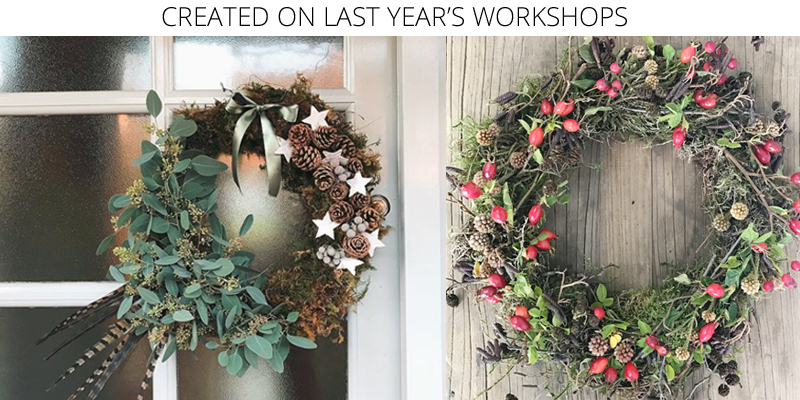 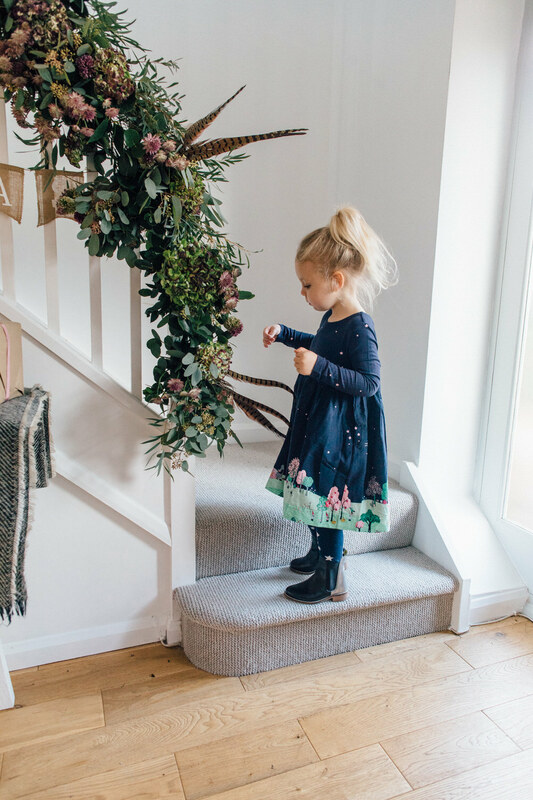 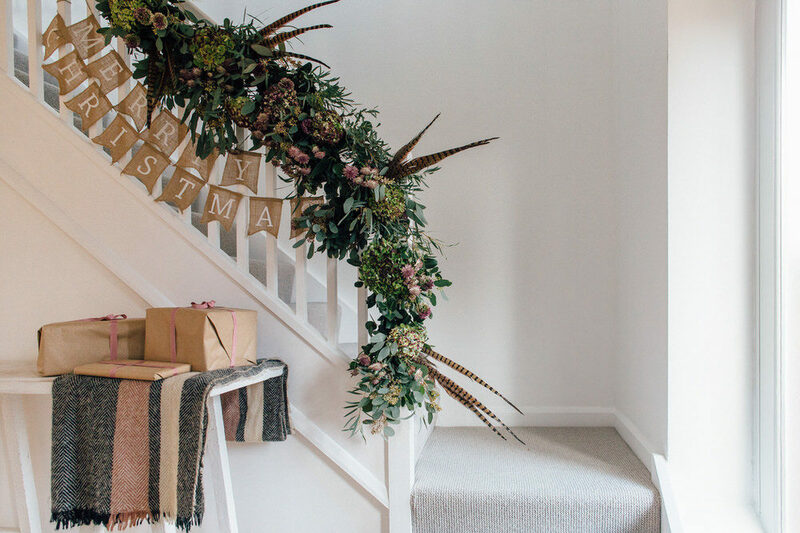 We will teach you how to make your own festive wreath to decorate your door for the festive period. 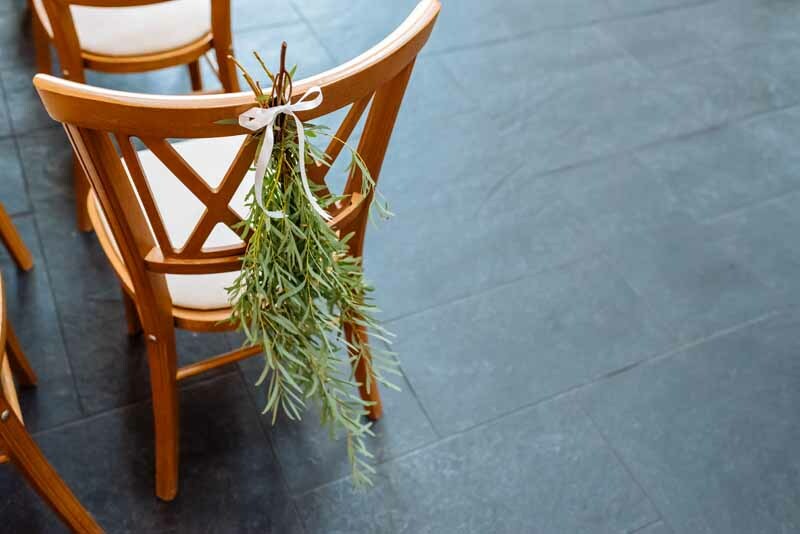 Have fun in a small group with plenty of help. 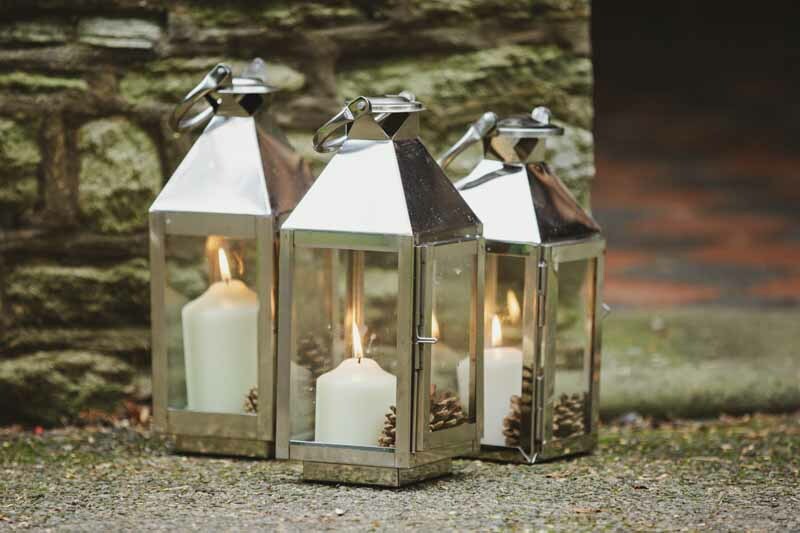 All tools, materials and equipment will be included as well as a glass of festive fizz and mince pies. 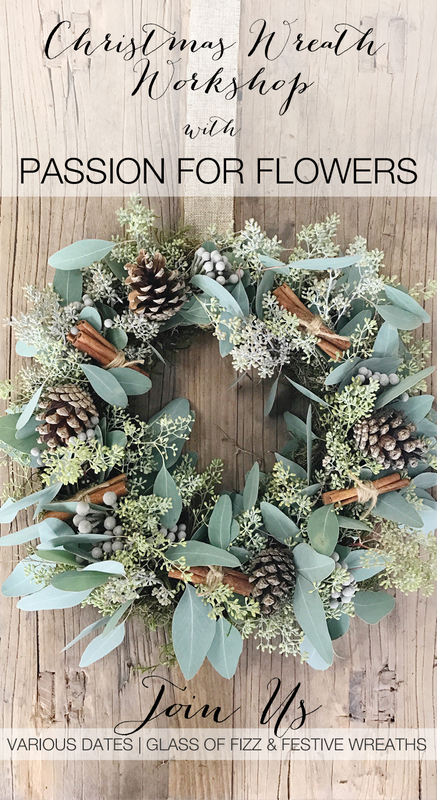 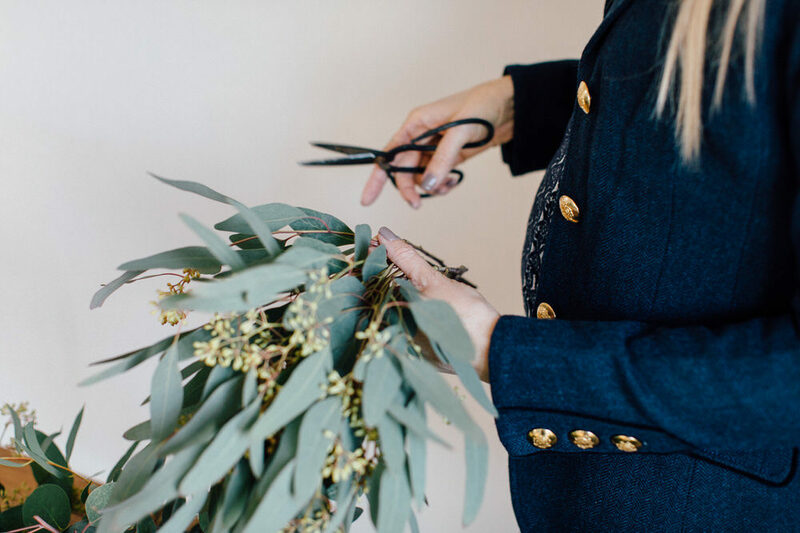 The wreath making workshops will be held in Passion for Flowers consultation room. 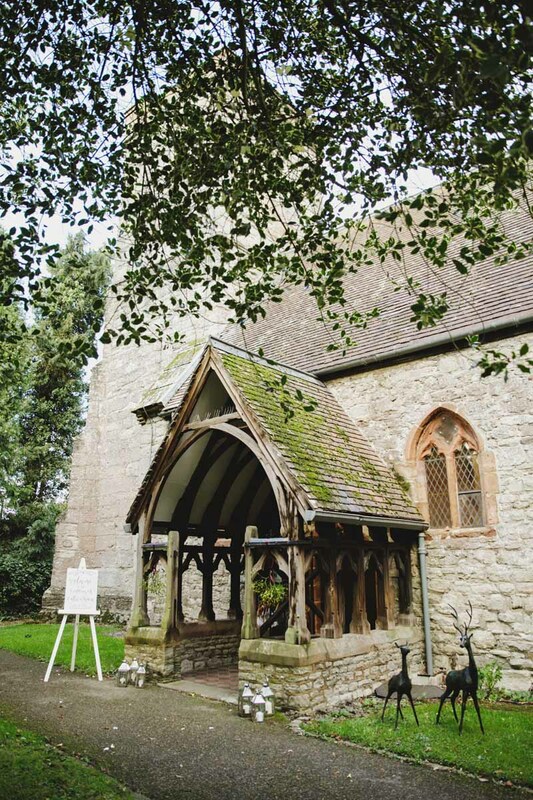 Balsall Common, CV7 7RE. 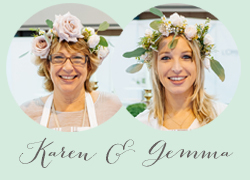 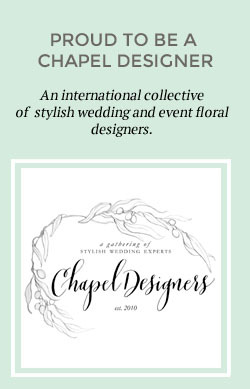 Email karen@passionforflowers.net confirming how many places you would like to book and which workshop you would like to attend. 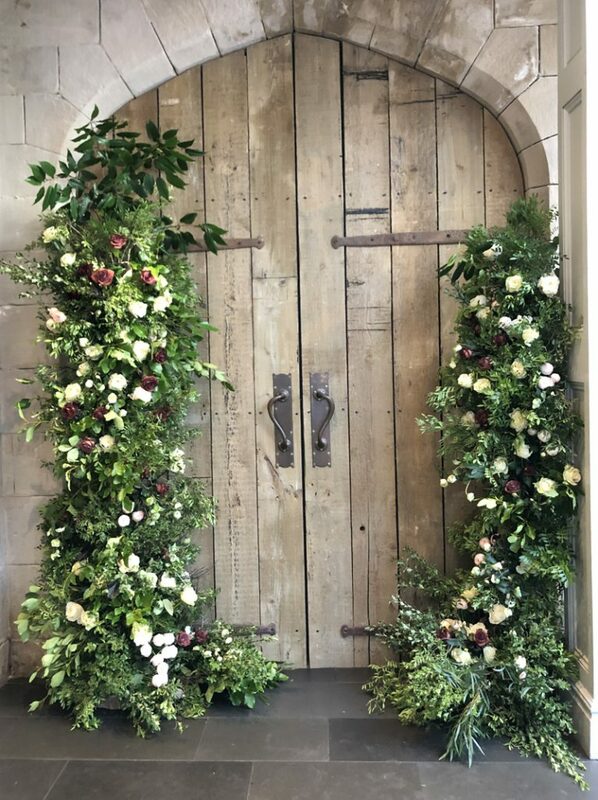 Passion for Flowers will also create wreaths to order, sizes and styles can vary to suit your door, prices start from £40 upwards. 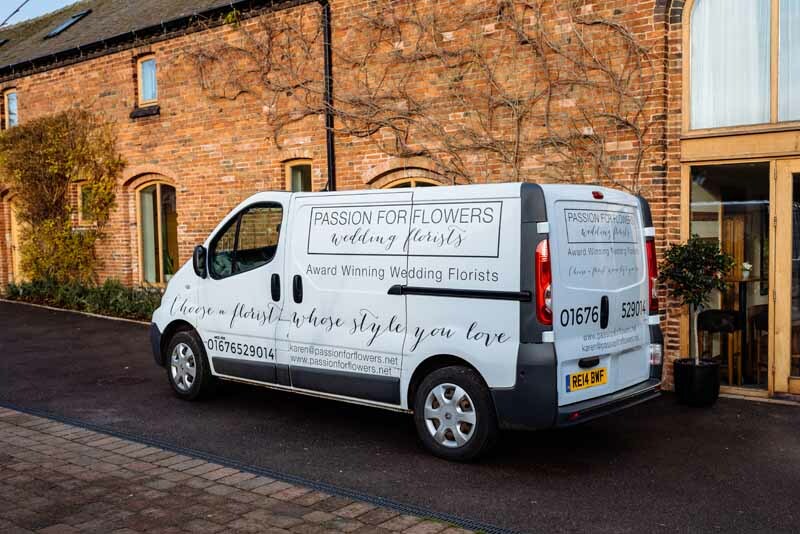 Email karen@passionforflowers.net to place your order, collection from Balsall Common before Christmas. 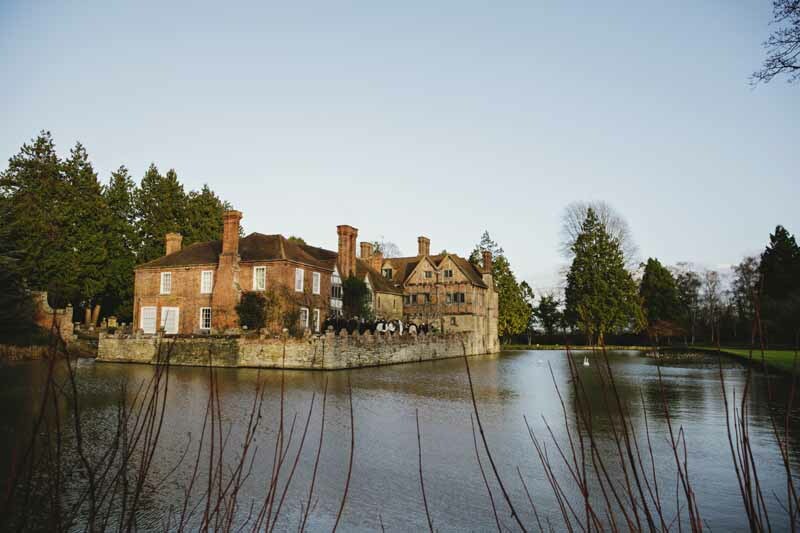 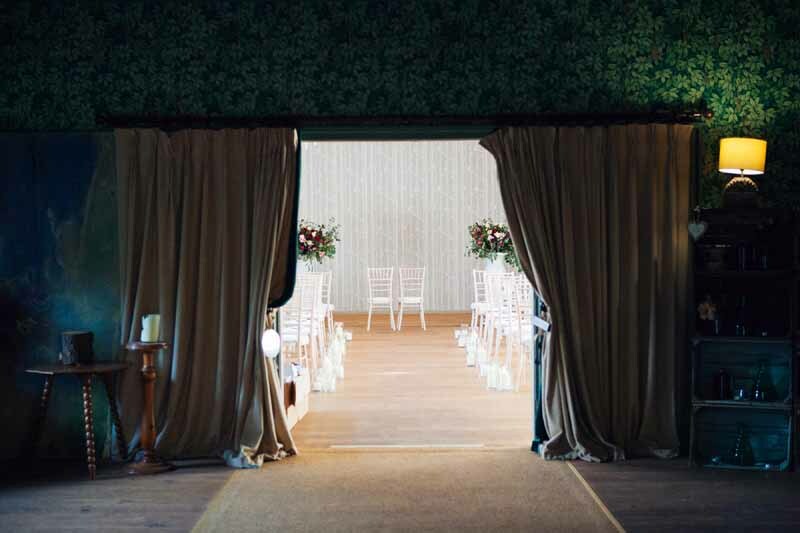 Hampton Manor is a beautiful place to tie the knot at any time of year but certainly comes into its own in the winter months. 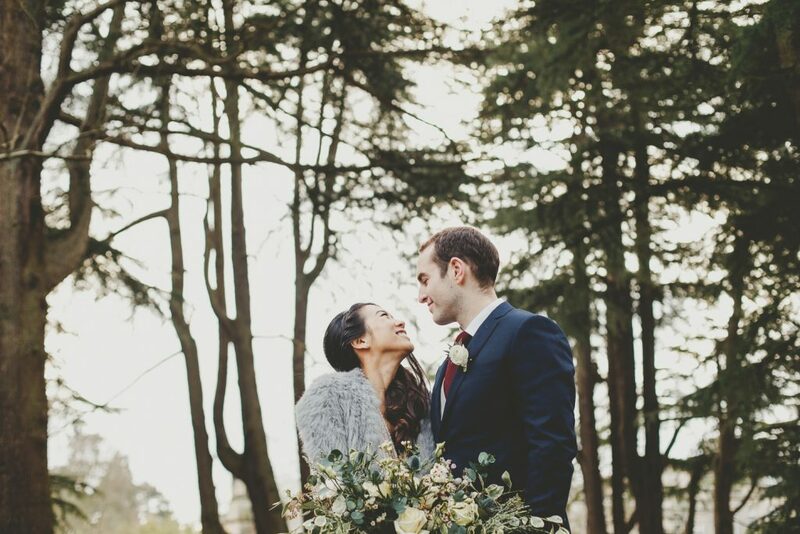 We loved creating flowers for the adorable Katie and Matt for their December wedding. 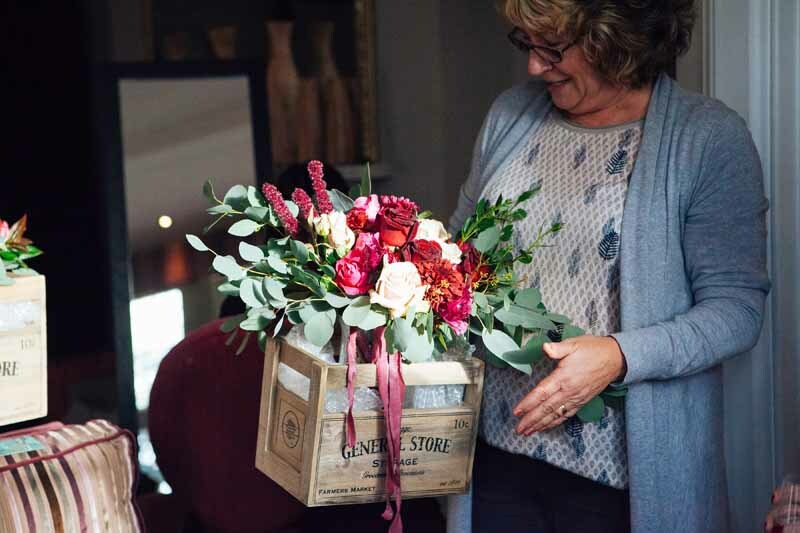 The moment of truth when you present your bridal bouquet to the bride is a moment of pure joy to behold. 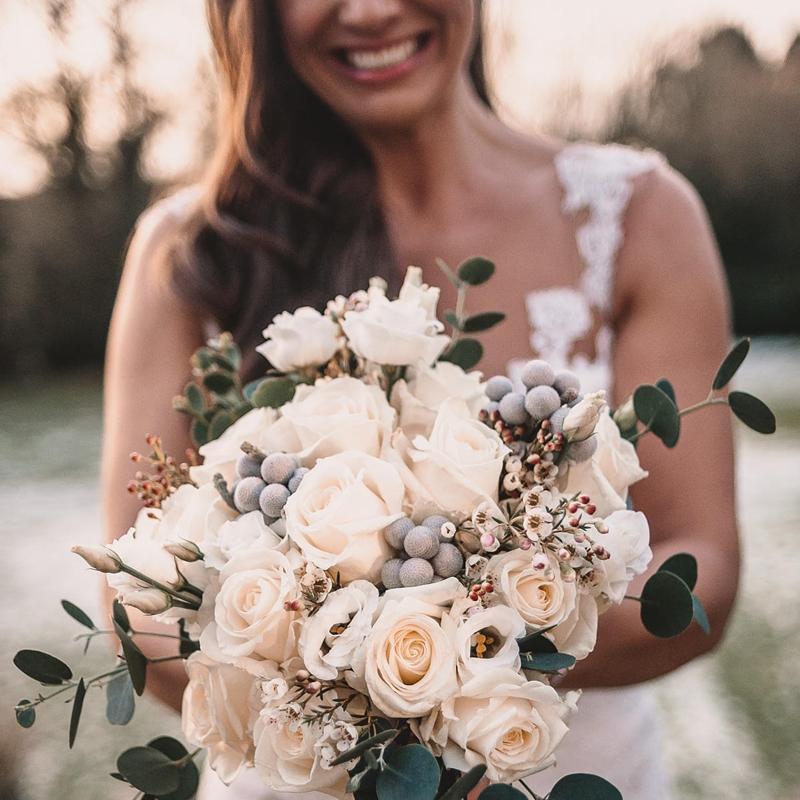 Katie was beyond excited and so happy with her bouquet. 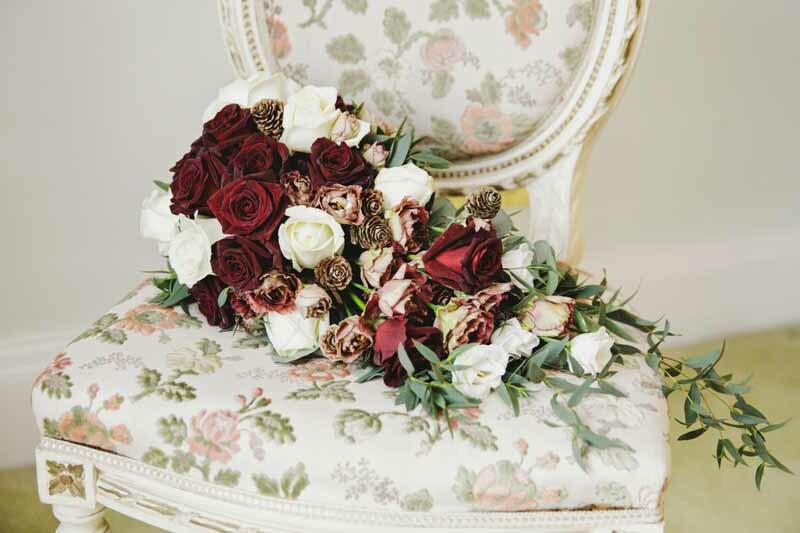 The flowers chosen had great sentimental value and were some of Katie’s Grandma’s favourites. 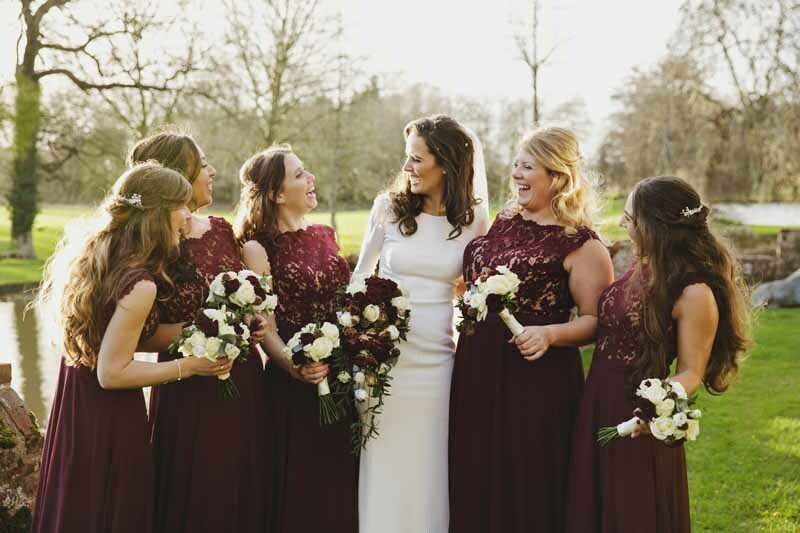 The girls look so elegant in their black bridesmaids gowns perfect for a winter black tie wedding. 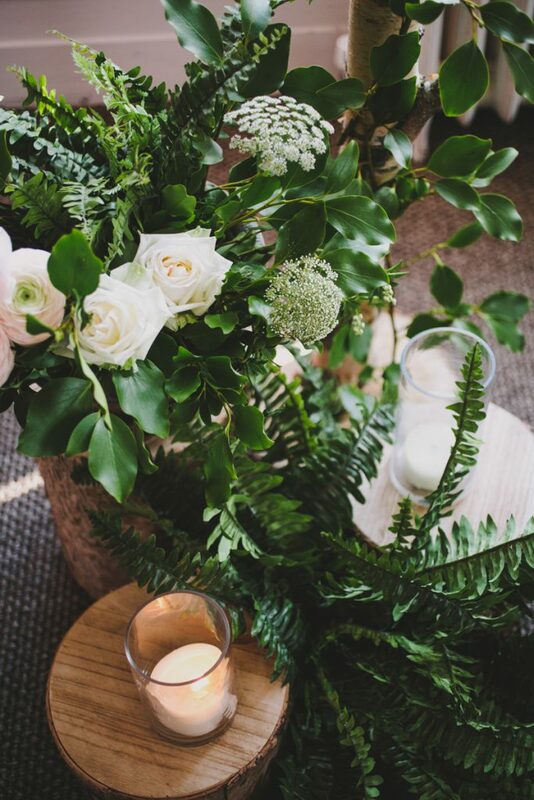 Scented white freeia, brunia and eucalyptus flowers for the ladies and delicate white raunculcus for the boys. 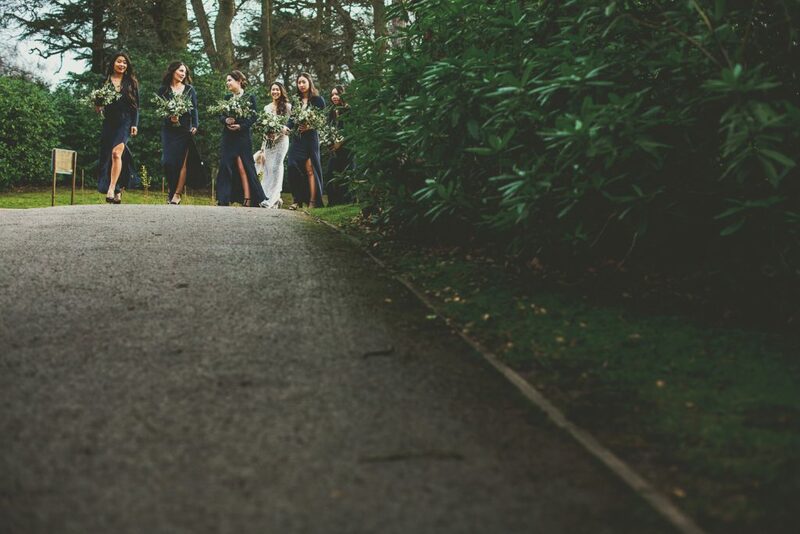 Katie’s excitement continued as she walked across to the Birches for her winter wedding ceremony, proudly let by Dad. 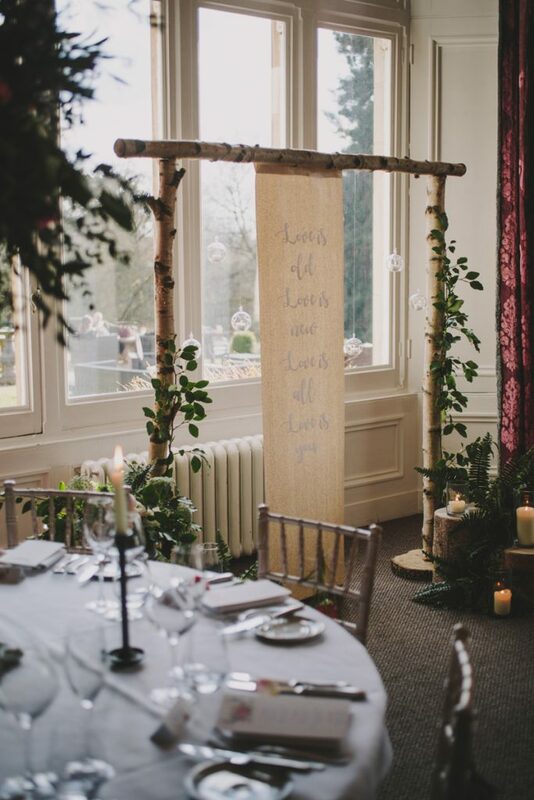 Our grey illuminated LOVE letters added a romantic touch to the Secret Garden room. 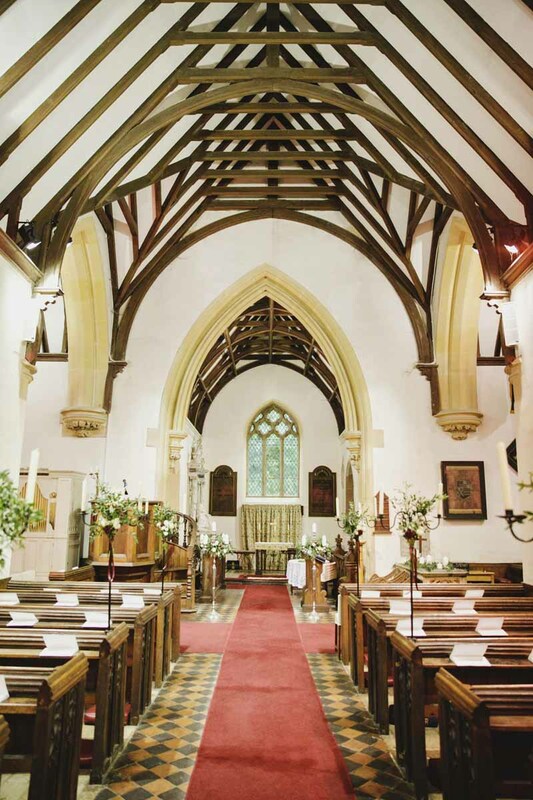 They are available to hire – check out our hire guide. 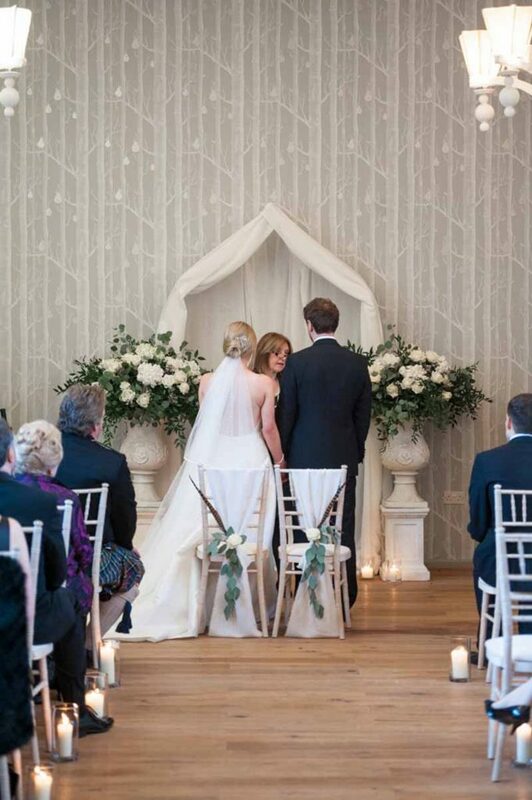 A beautiful backdrop was created with the purest white drapes for an elegant arch with large urns with a mass of foliage and white blooms. 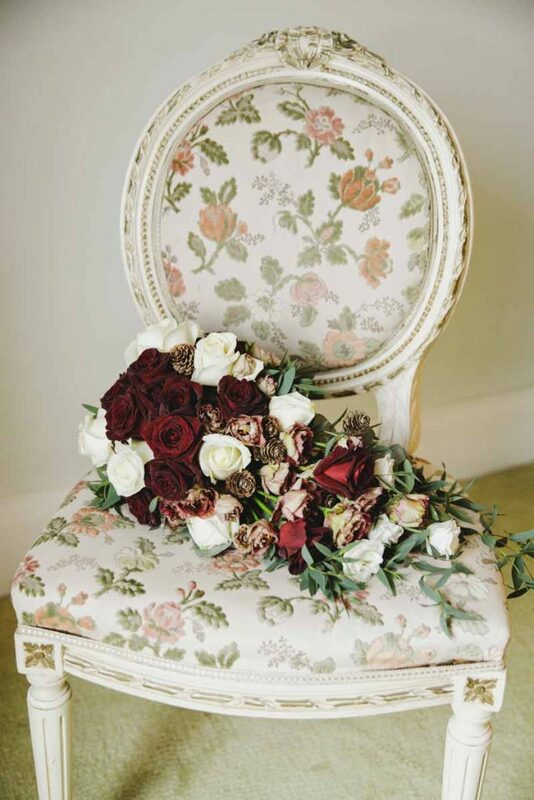 The bride and groom chair backs including a pheasant feather added a touch of whimsy. 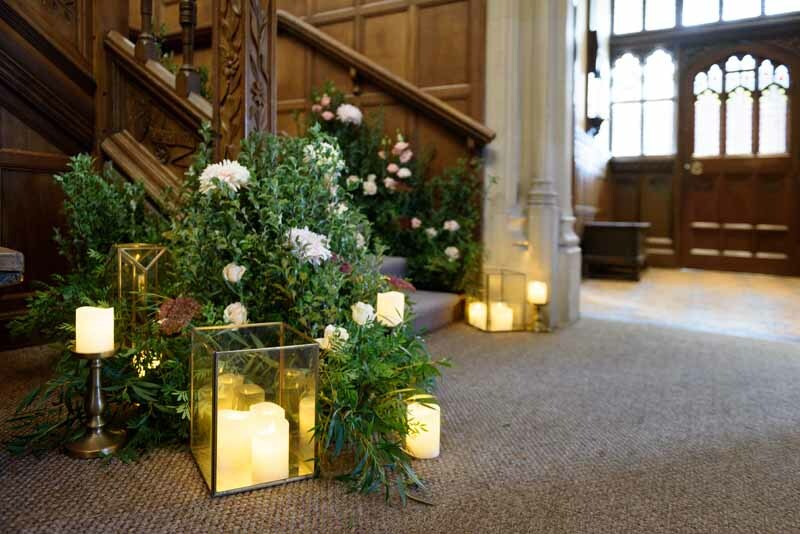 Lanterns down the aisle added a magical light and a lush foliage and floral garland decorated the registry table. 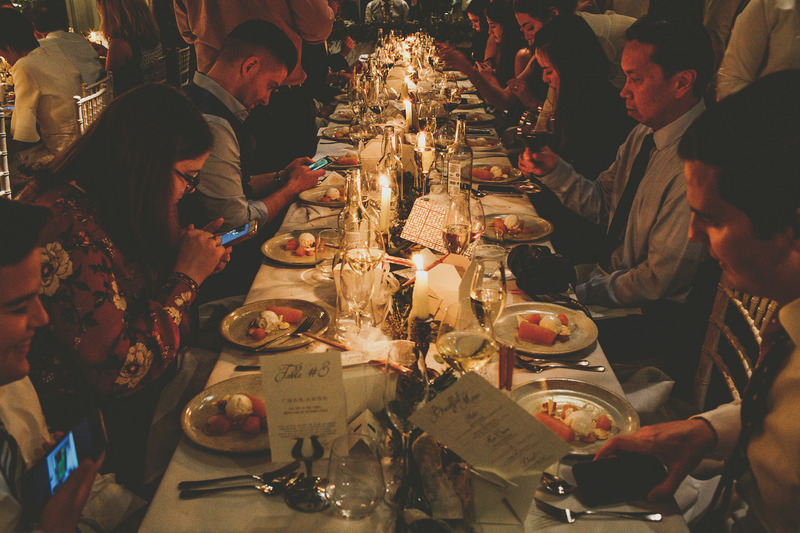 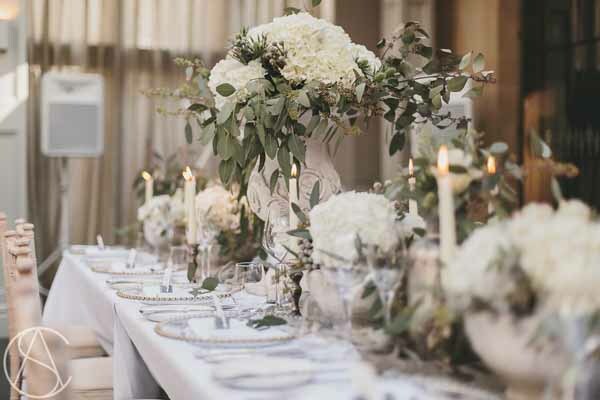 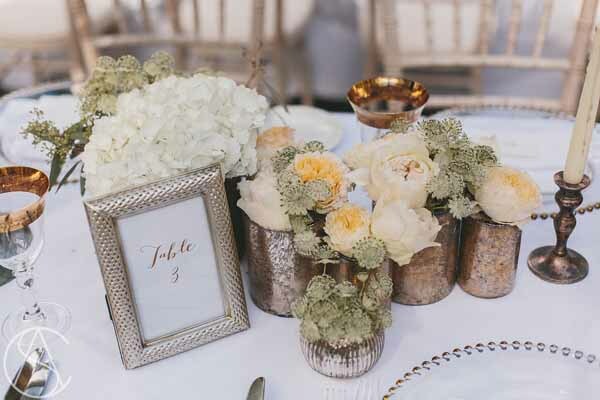 The long tables were decorated with foliage garlands in tiny vases with delicate blooms. 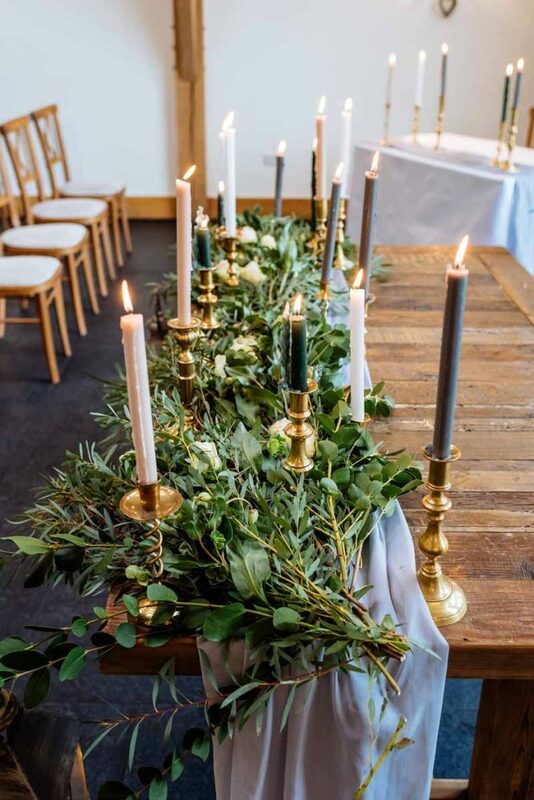 Candlesticks ran the length of the tables giving off elegant light. 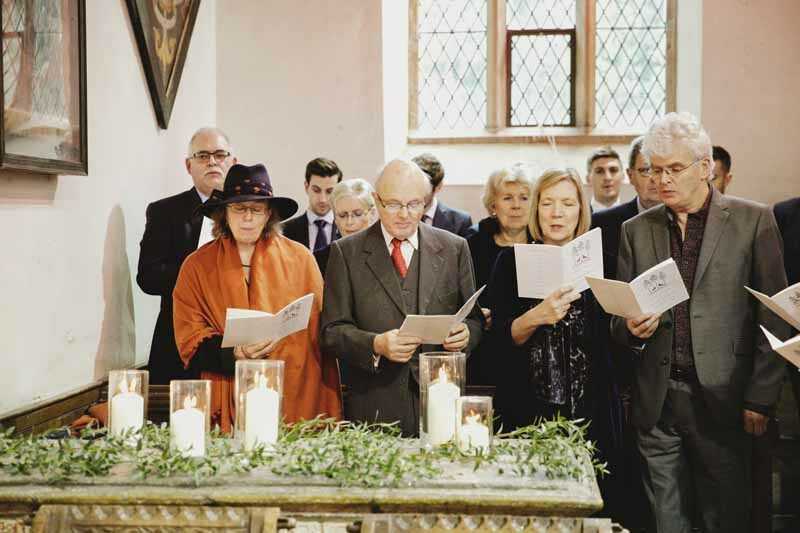 The seating plan had a touch of foliage, softest white roses and pheasant feathers. 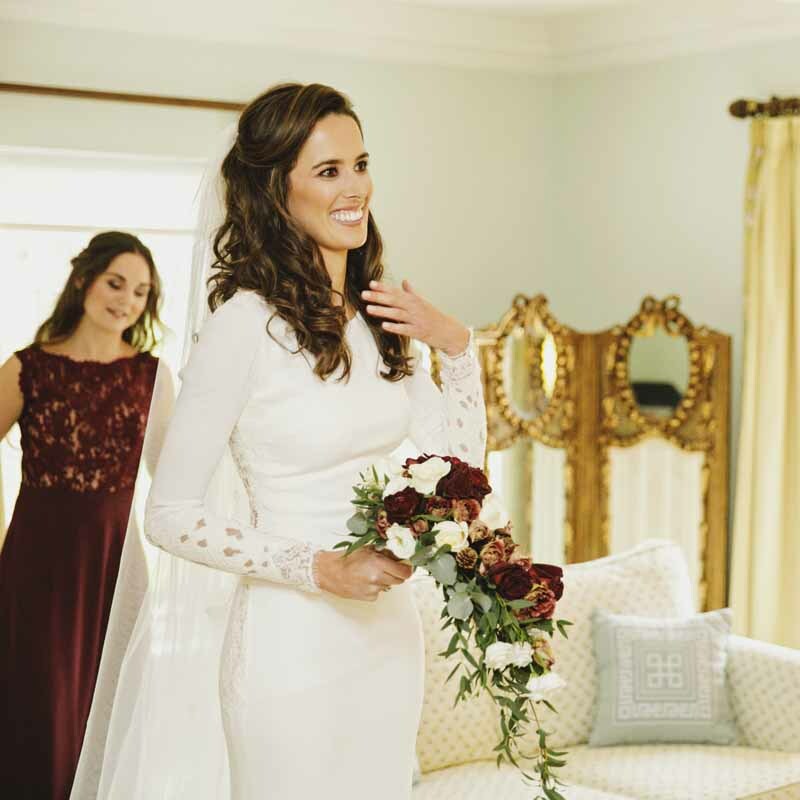 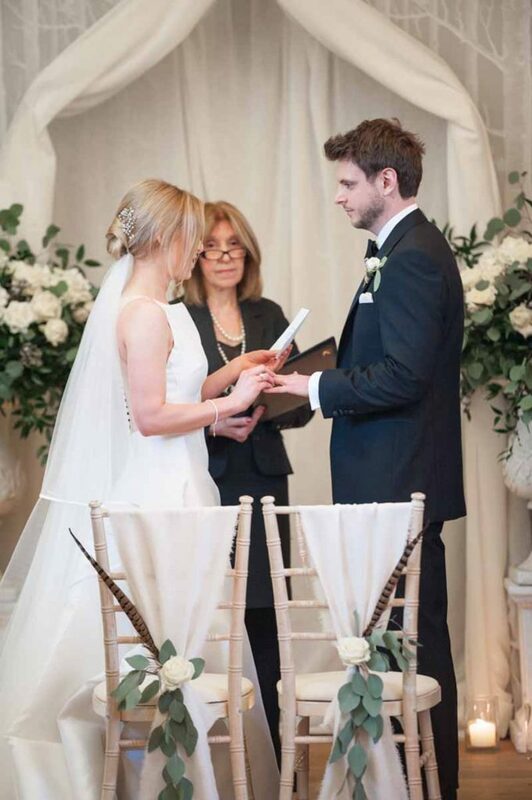 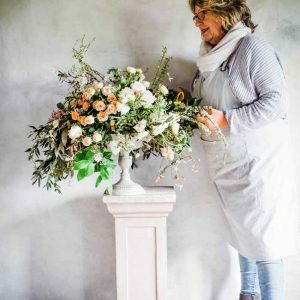 We loved working with Katie, her dearest mum and family on the styling and flowers for her wedding. 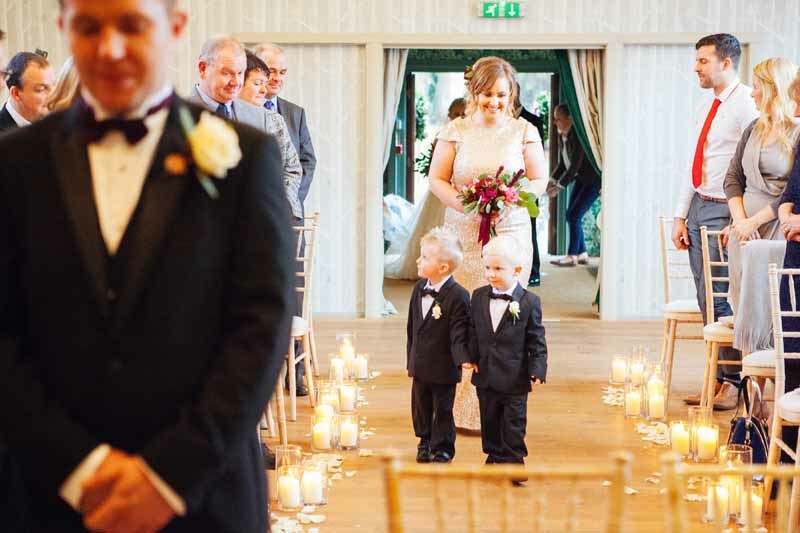 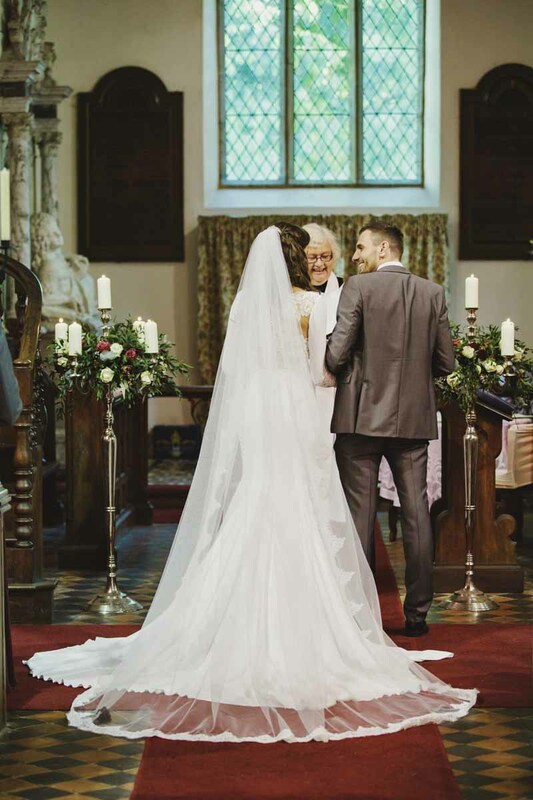 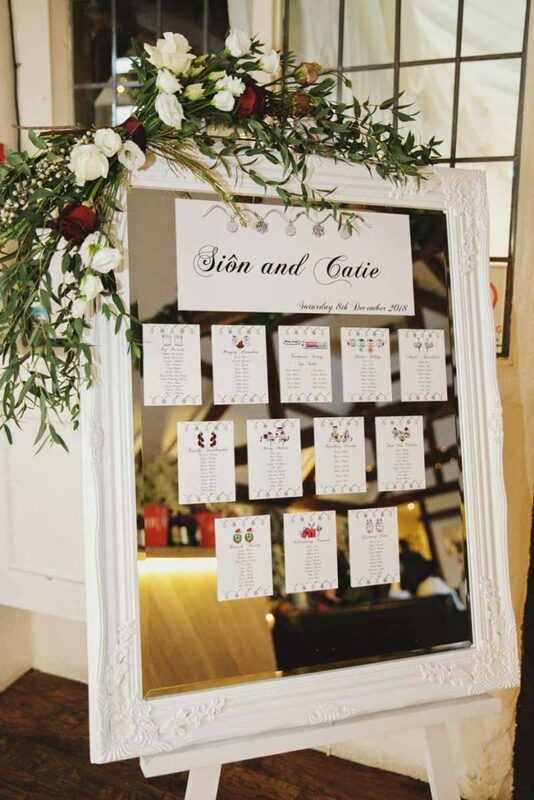 There were so many beautiful touches chosen by the family to make the day so memorable. 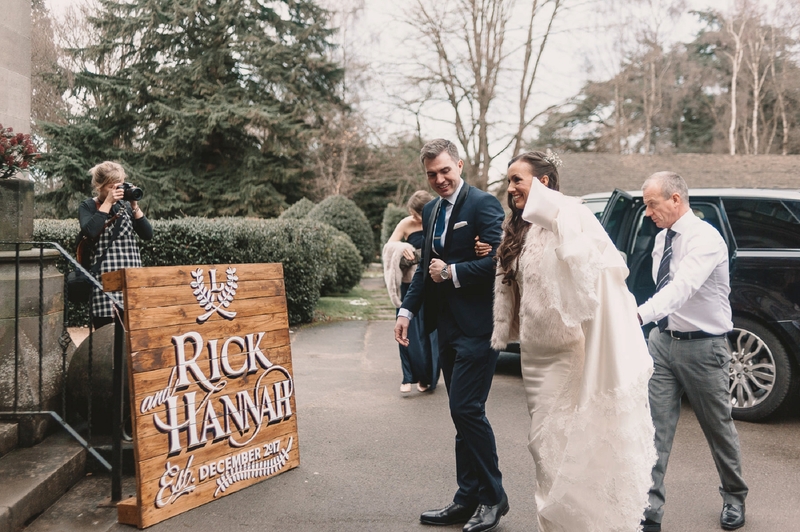 Love to you all and thank you for sharing these wonderful memories of your day. 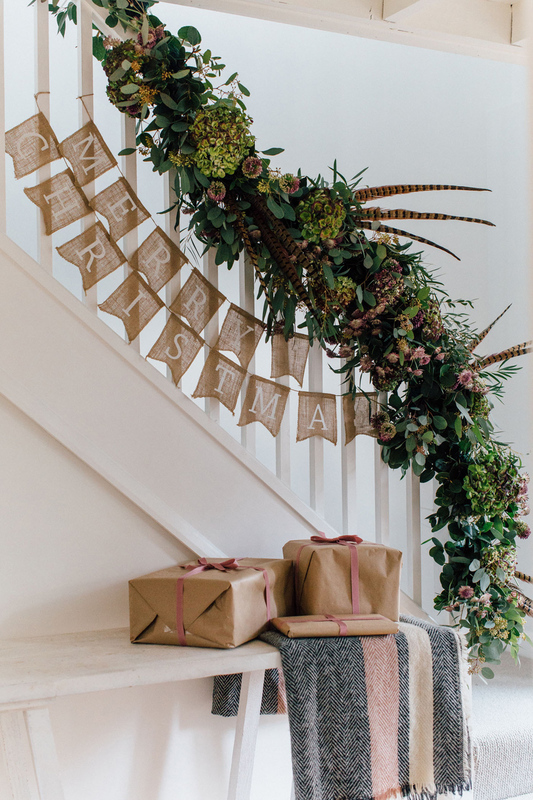 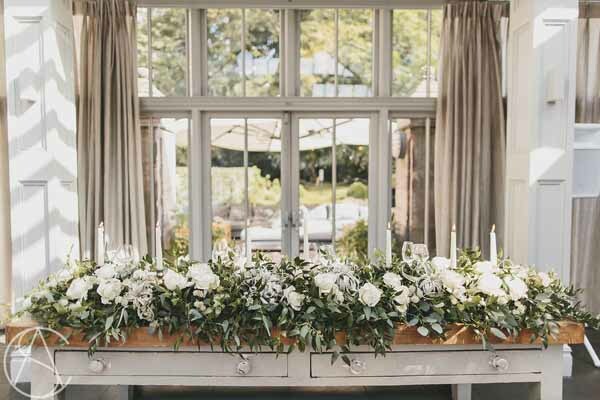 We love Hampton Manor weddings and were delighted to have free rein to decorate the sumptuous Elizabeth’s Court for the autumn wedding fair. 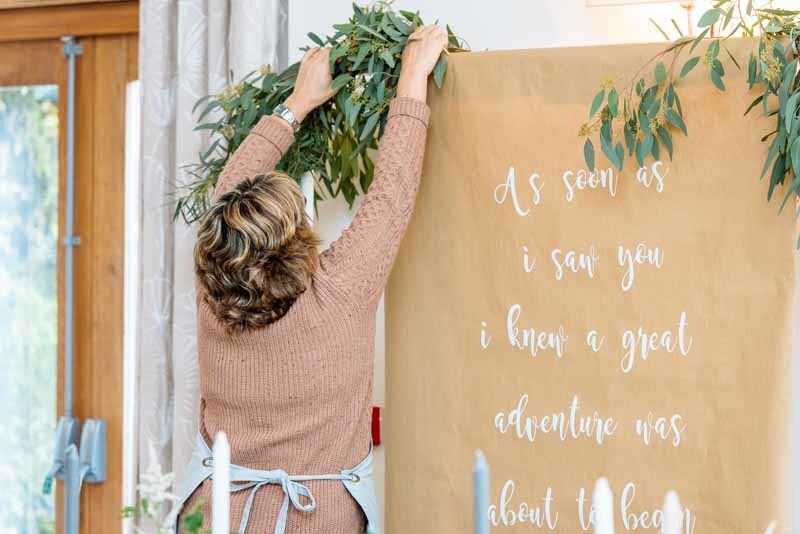 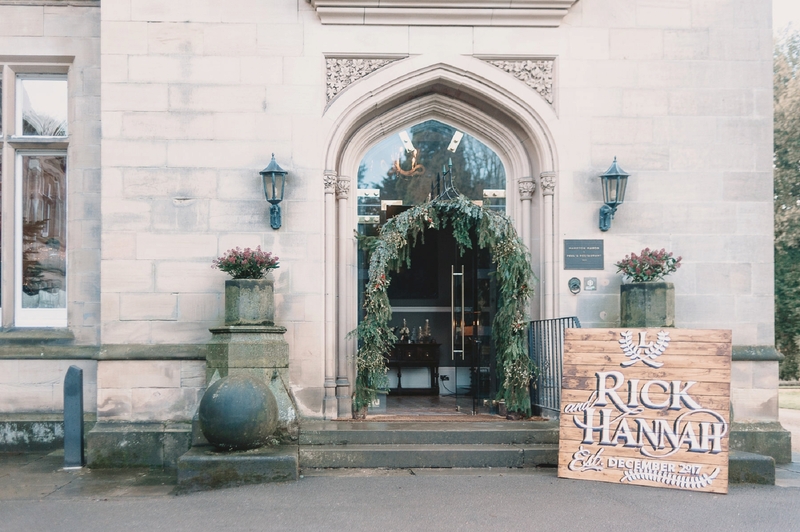 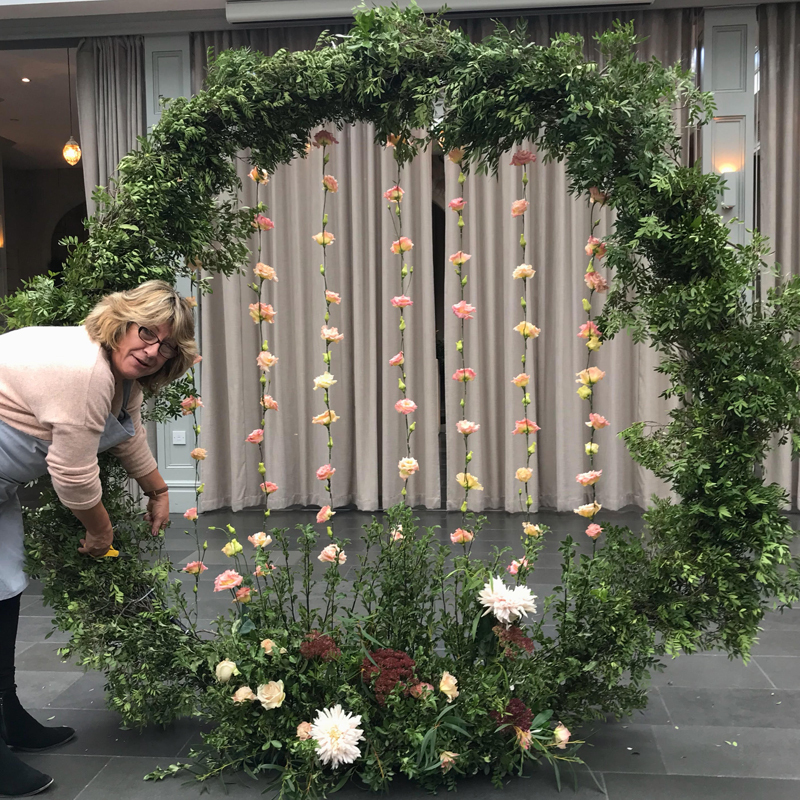 We enjoyed meeting a number of wedding couples and showing them how they could decorate the venue to suit their wedding style and season. 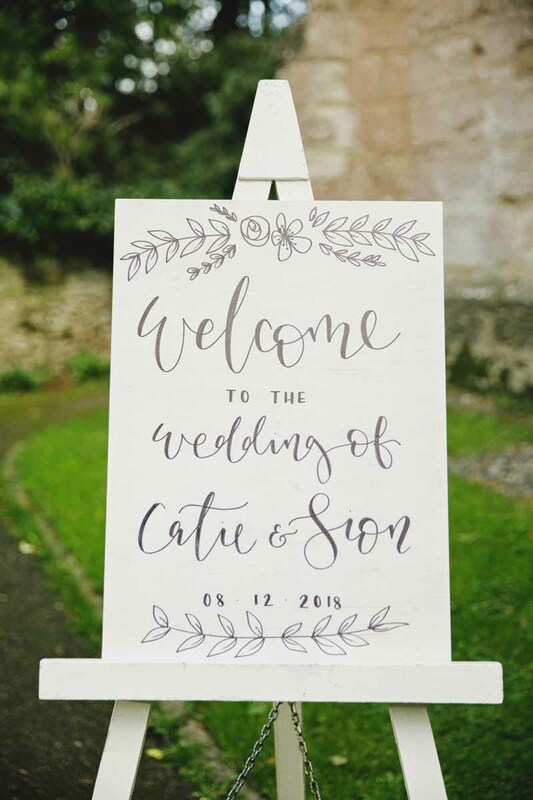 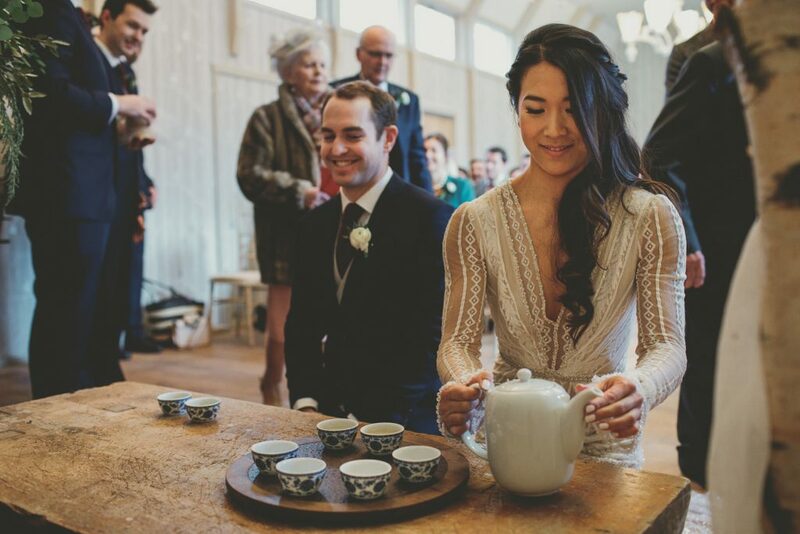 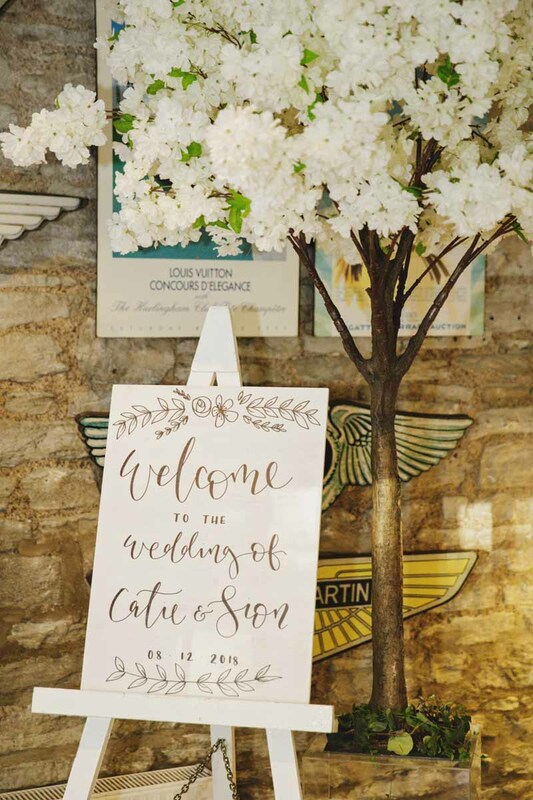 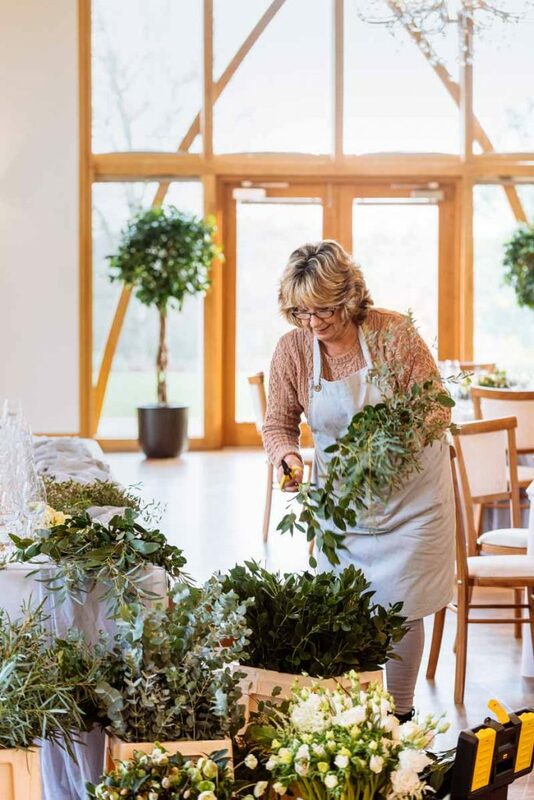 Since then we have been busy meeting with couples at our studio at Home Farm in Berkswell where we have an ever expanding range of vases, vessels and large scale props to make your wedding day your own. 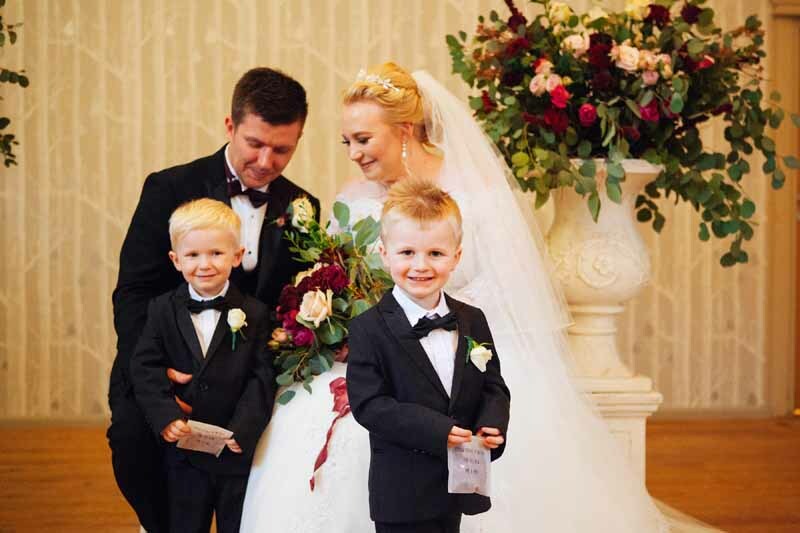 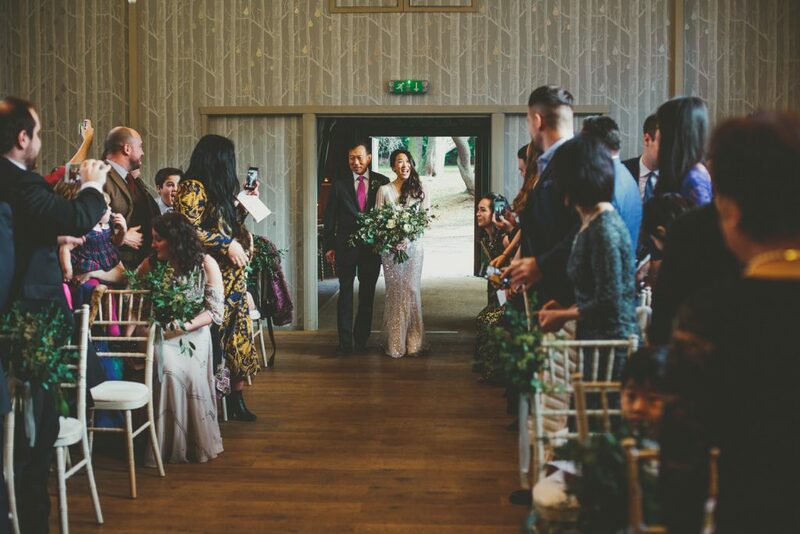 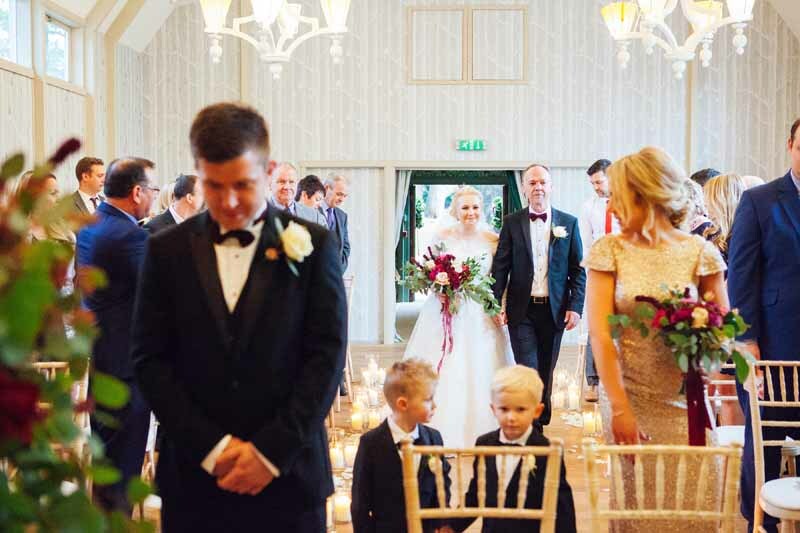 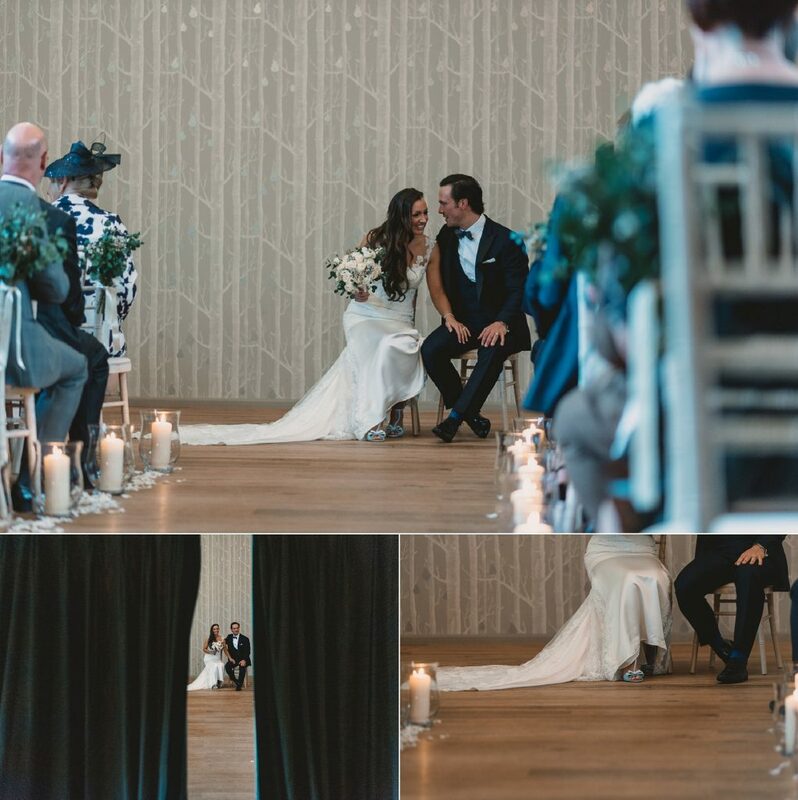 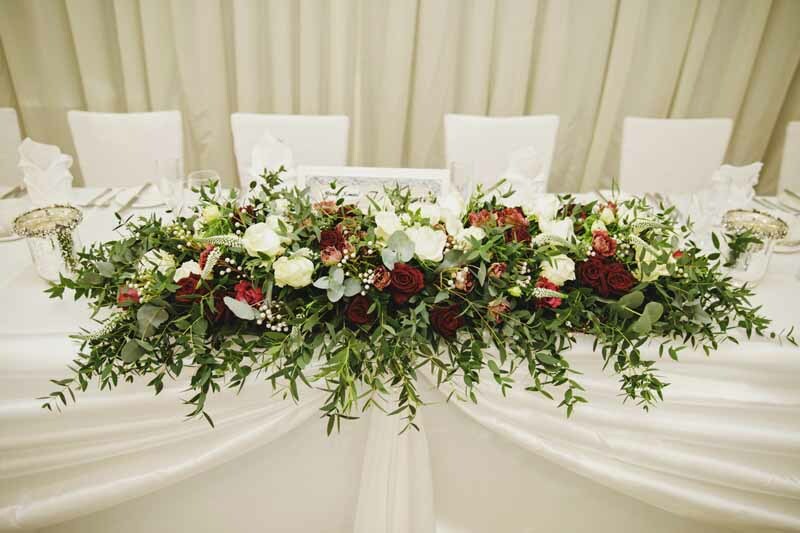 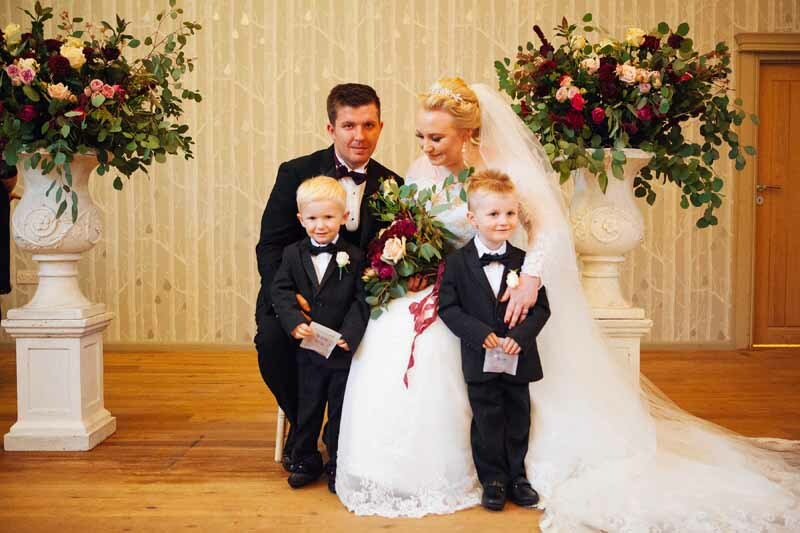 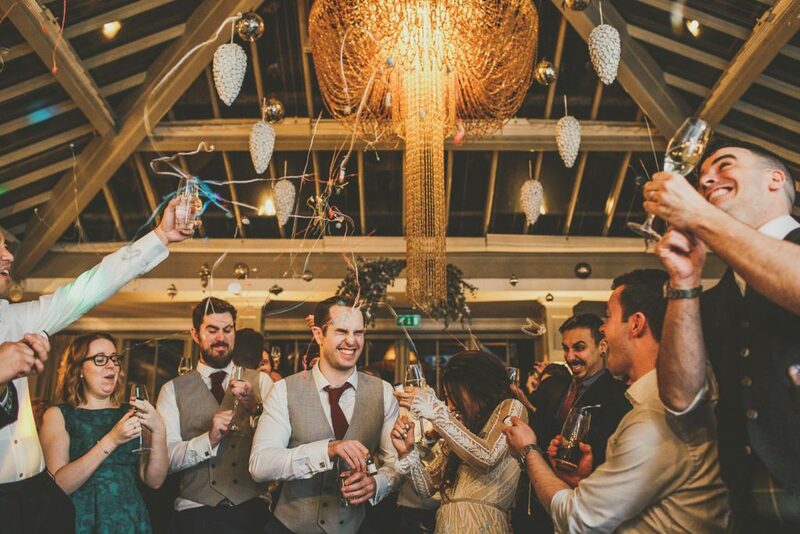 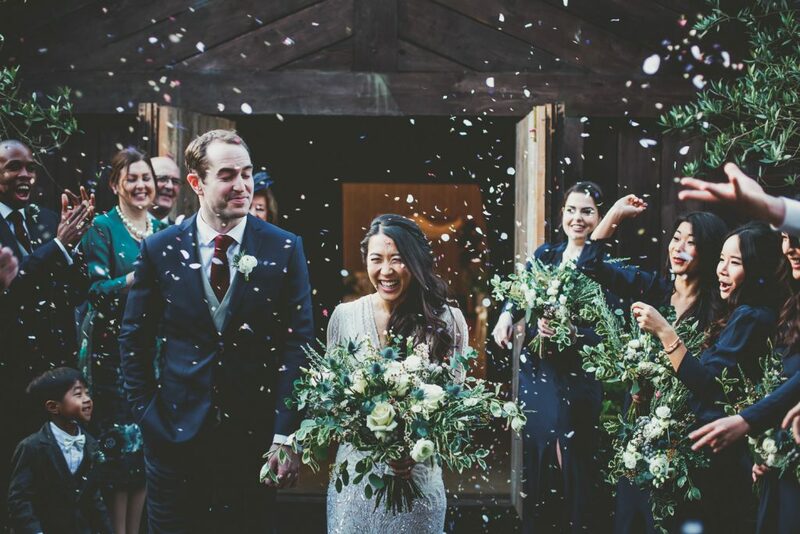 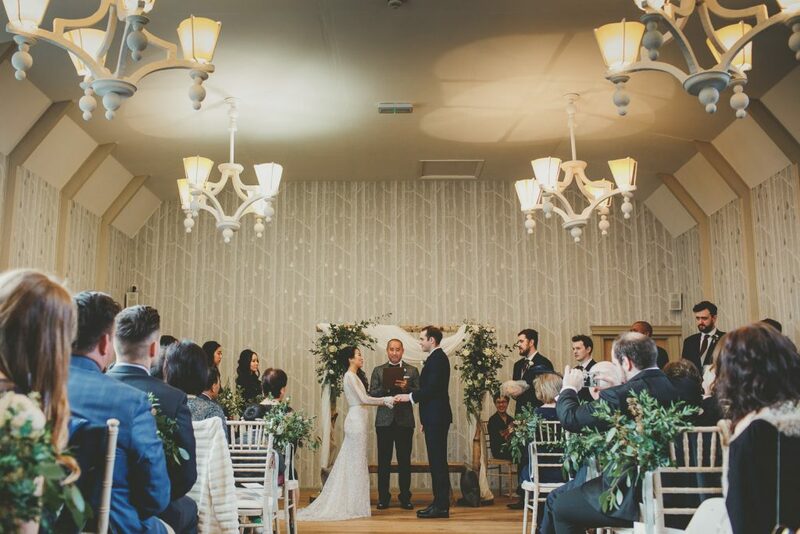 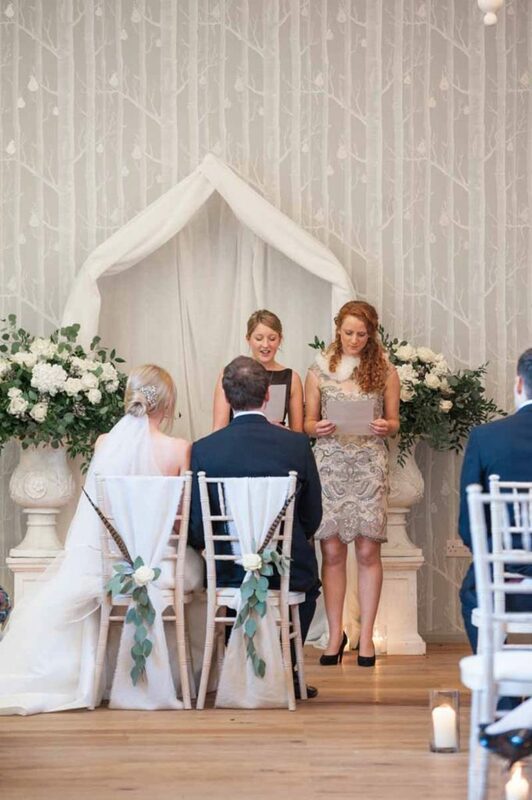 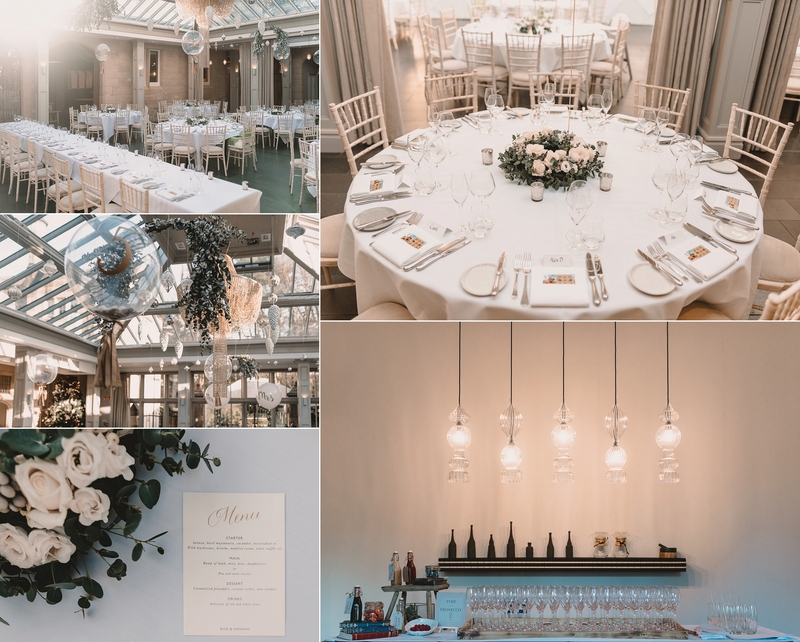 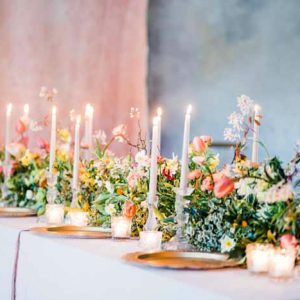 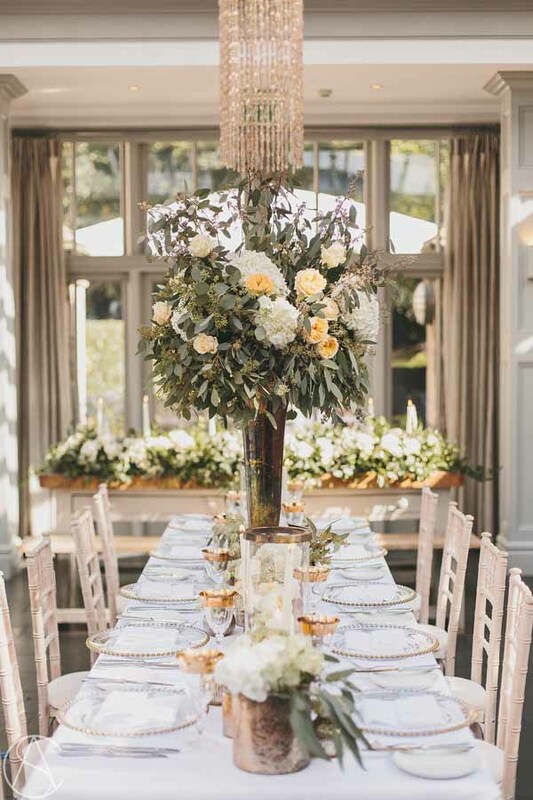 At your wedding reception all eyes are on the top table so make a statement with your florals as these will be captured in your photos of the speeches on the day. 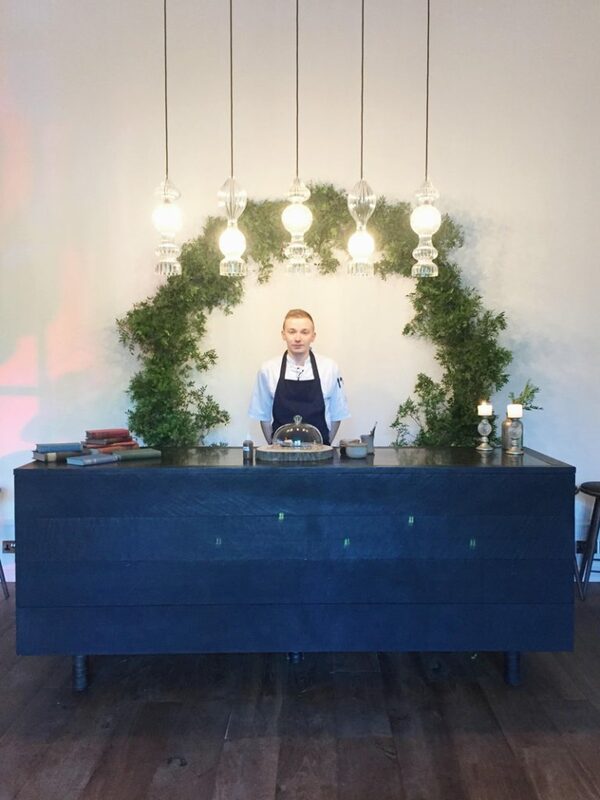 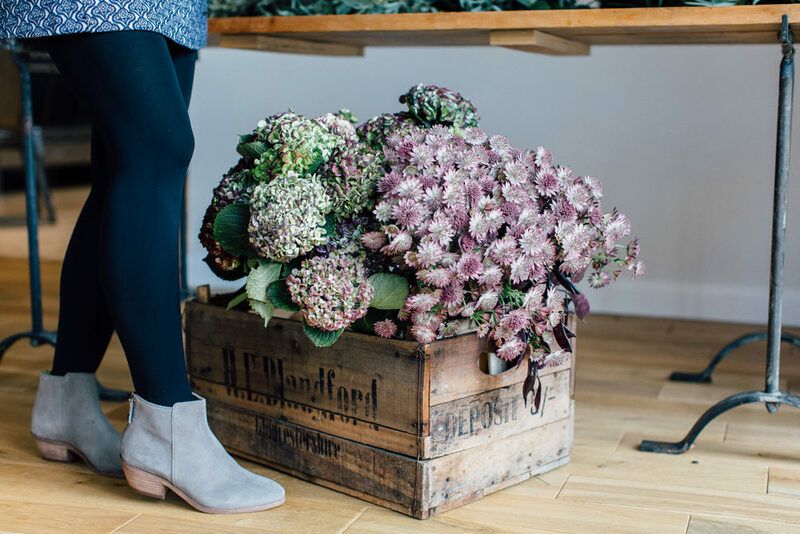 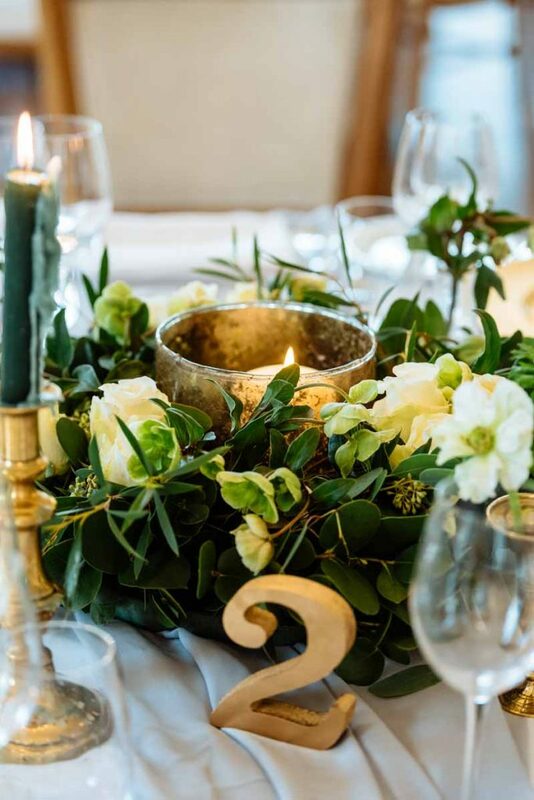 We love decorating the Butchers Block table with an abundance of mixed foliage with flowers and added textures. For this look we added roses, brunia and air plants for great texture. 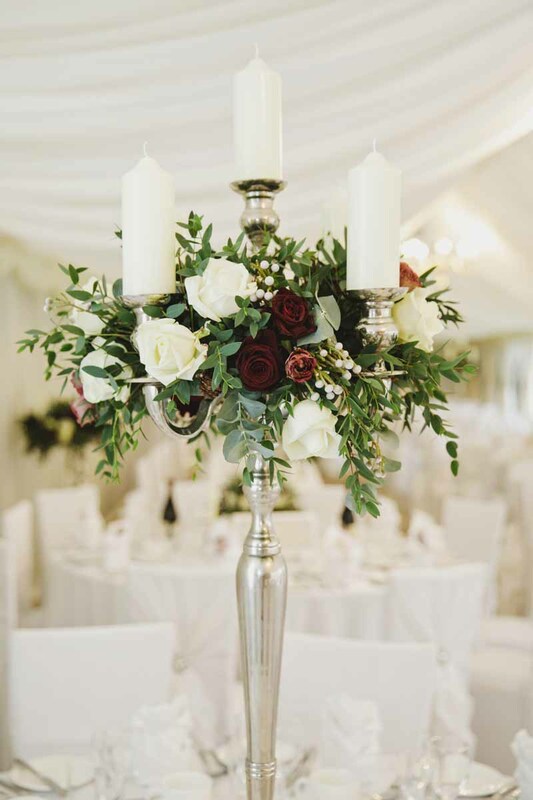 Elegant silver candlesticks complete the look. 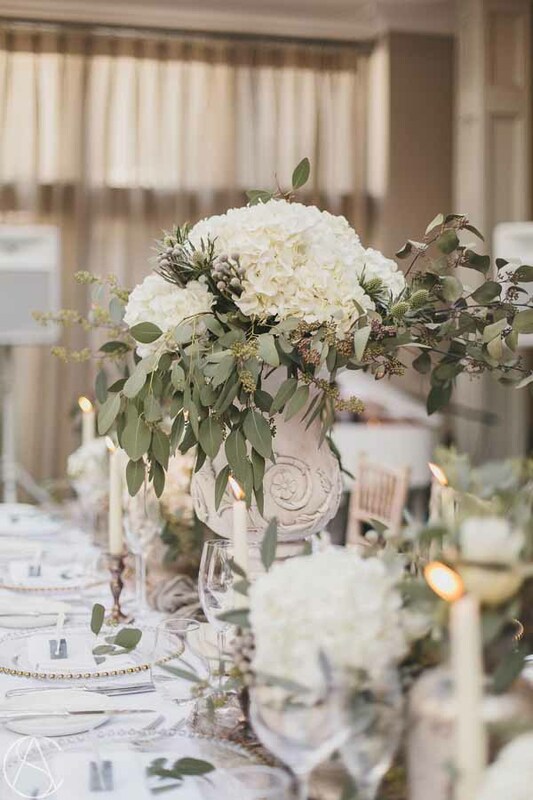 White, grey and green and a perfect choice for an elegant wedding whatever the season for a timeless look. 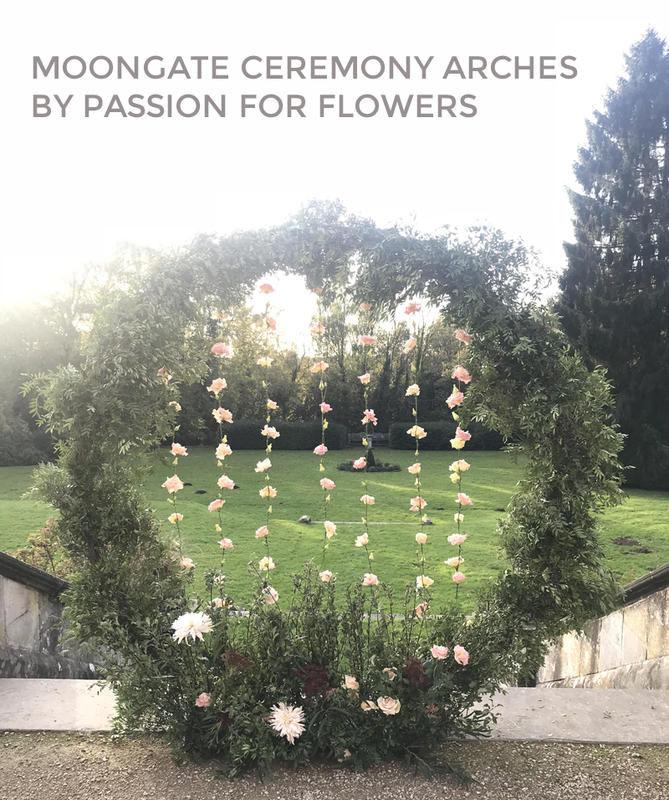 For a spring take on this we would include some white tulips and ranunulus in the design. 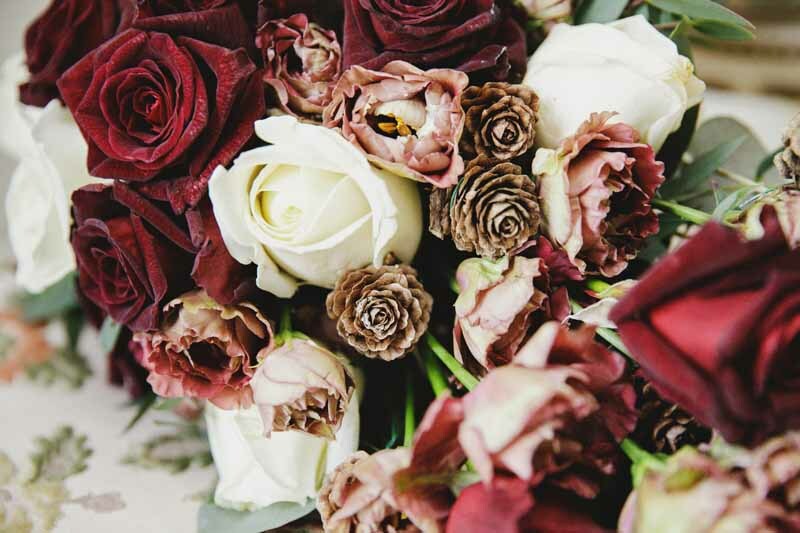 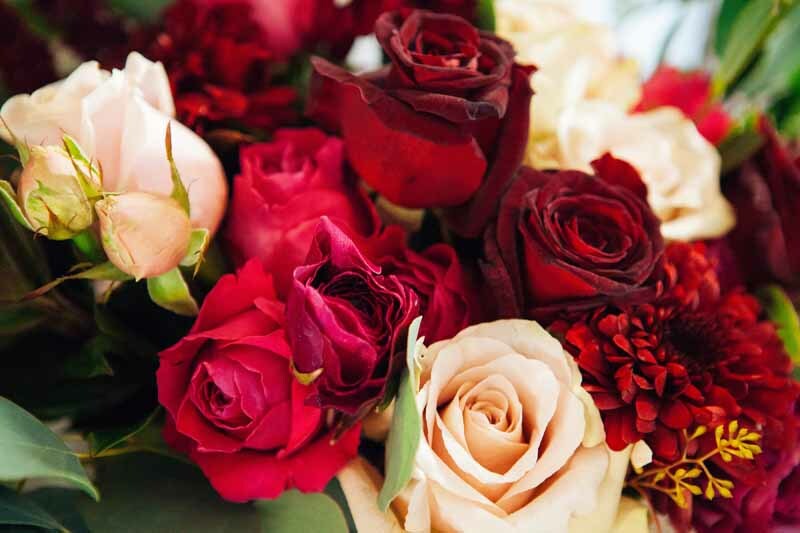 There is always a choice of flower to add to create a great look with the season and your wedding colours in mind. 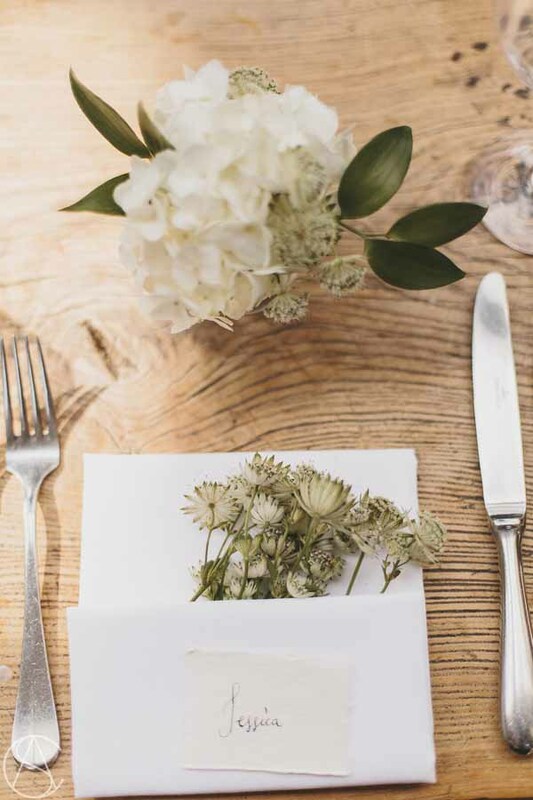 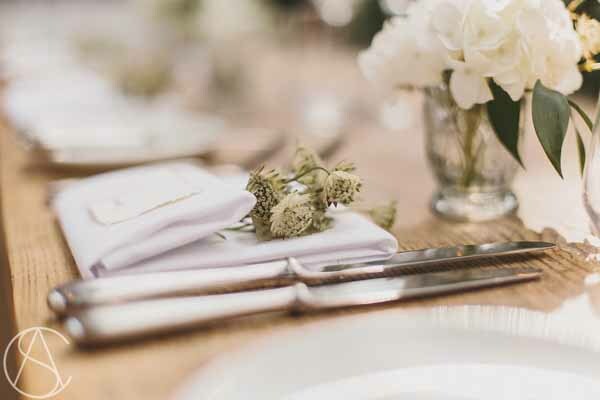 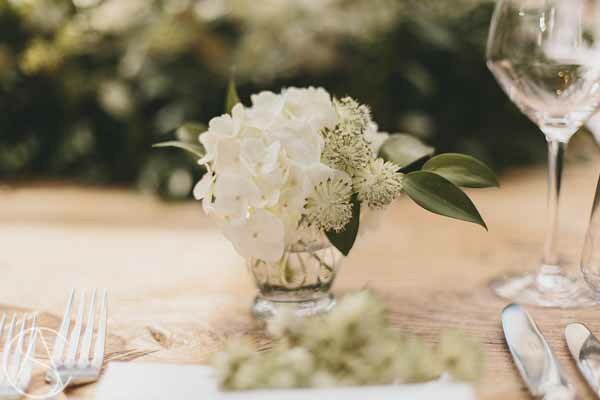 Add interest to the place settings with a pocketful of delicate astrantia nestled in the napkin. 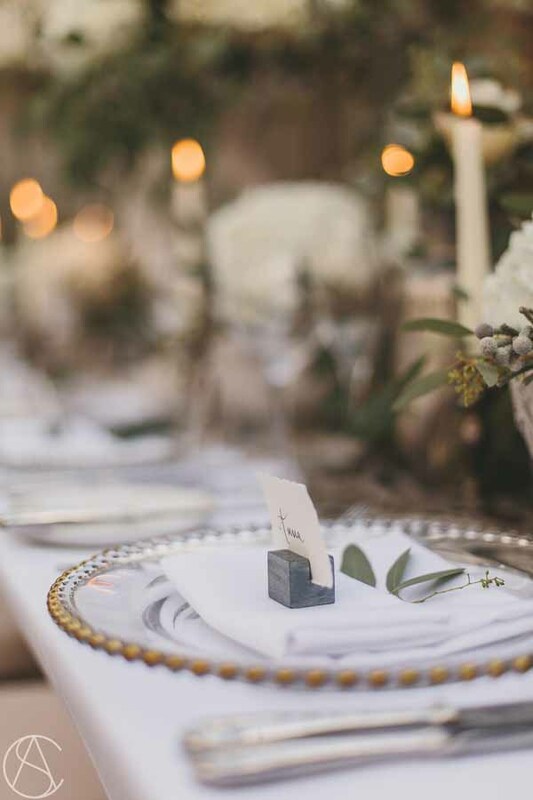 Posy vases by the place settings also add a welcome personal touch. 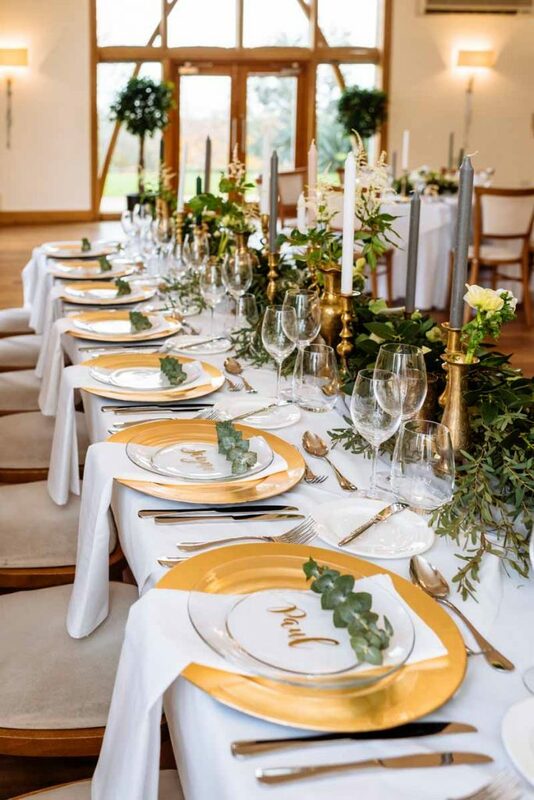 Metallics are still hot news and look oh so stunning at the Manor, this look is perfect for an overstated elegant look with a bit of glitz and glamour. 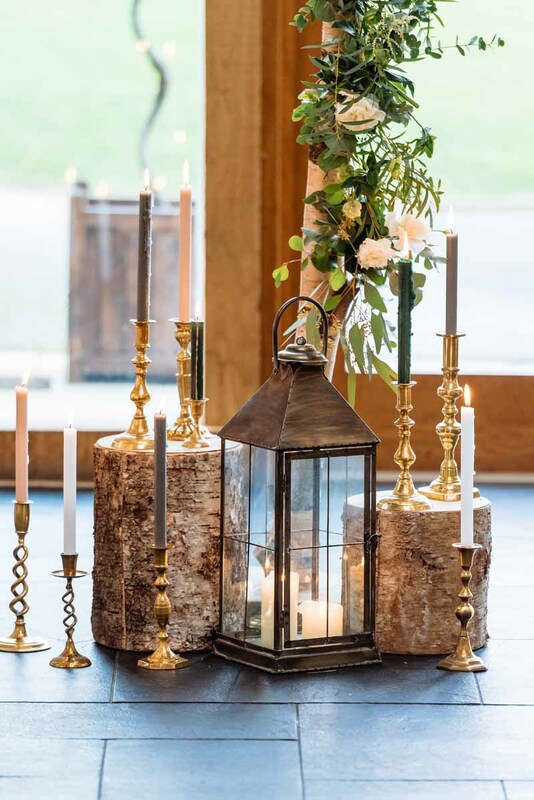 See how the tall bronze vases goes so well with the stunning chandelier in the room. 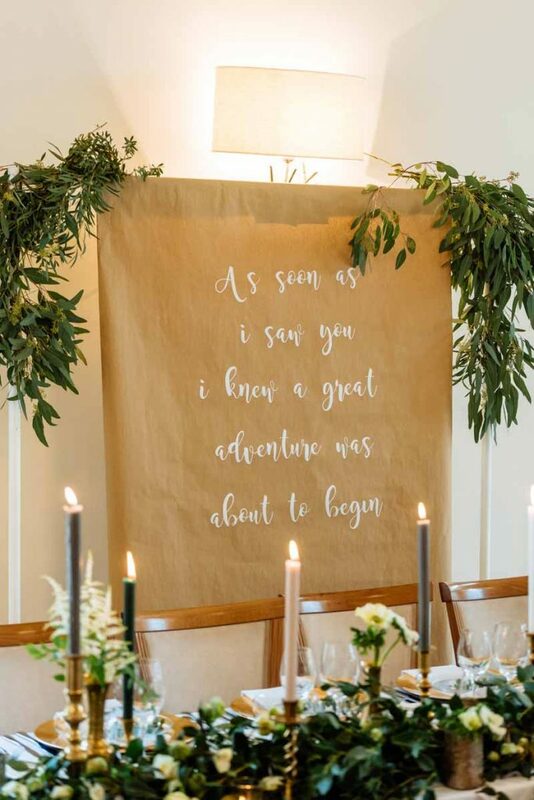 We always look to tie in your wedding decor with the room and your bespoke theme. 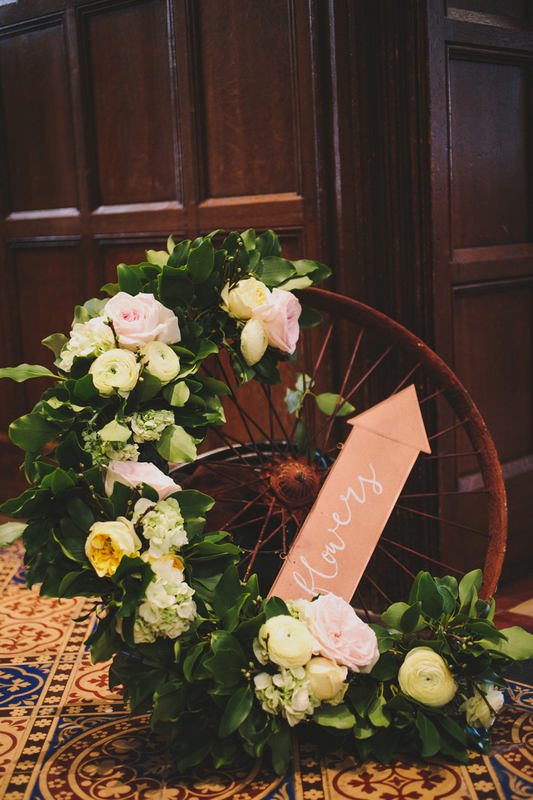 Peach roses and cream hydrangea brought out the warmth to this look. 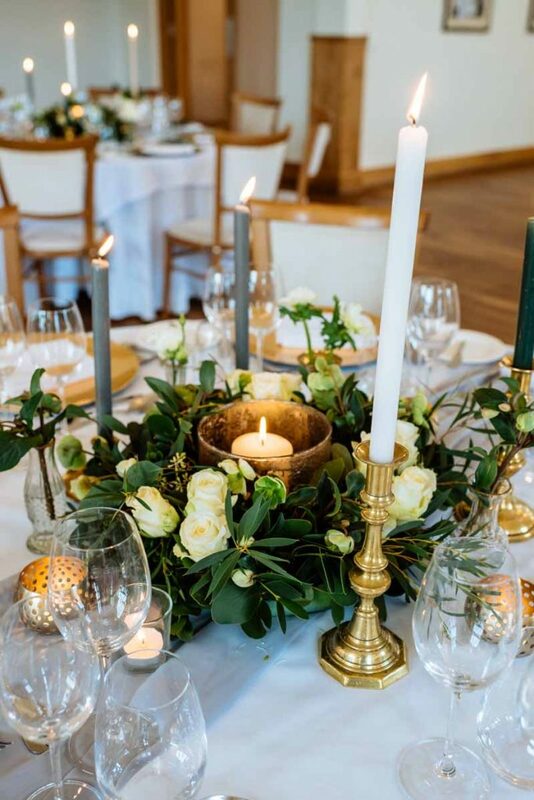 Team with gold and bronze lower vases running along the table and add gold rimmed glasses for an elegant look. 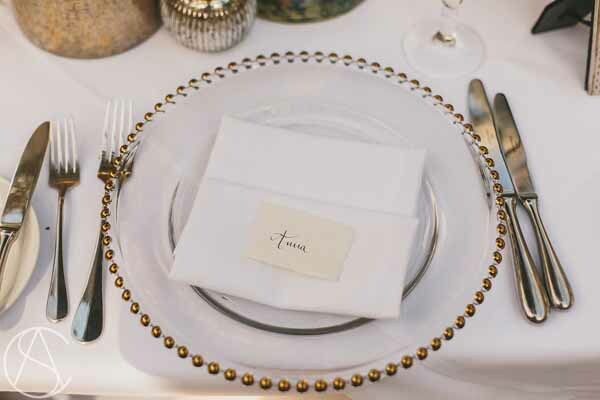 The glass charger plates keep this fresh and contemporary. 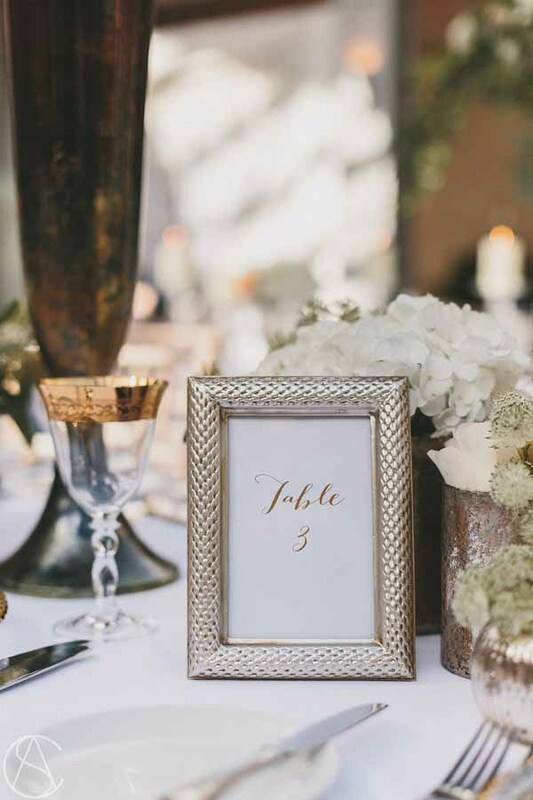 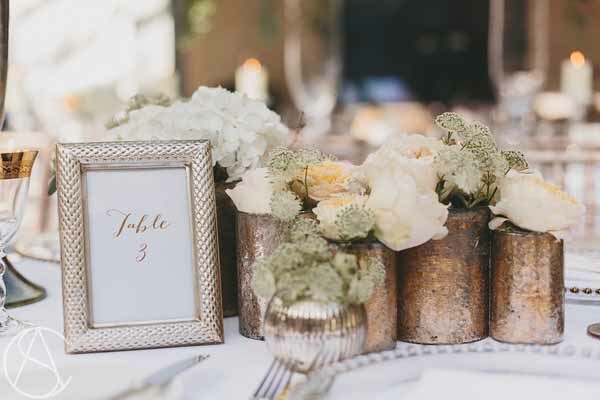 Photo frames in opulent metallic finish add a finishing touch to the tablescape. 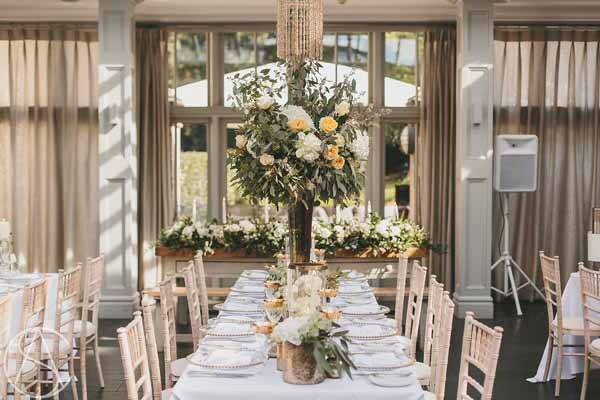 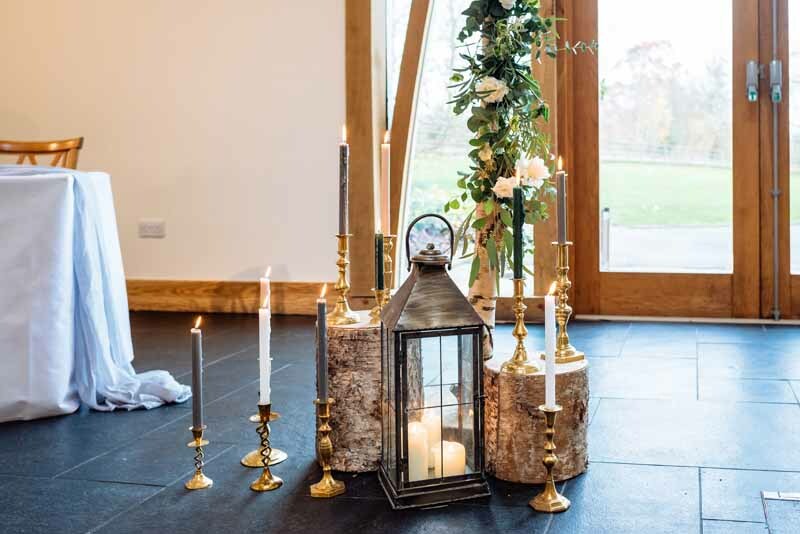 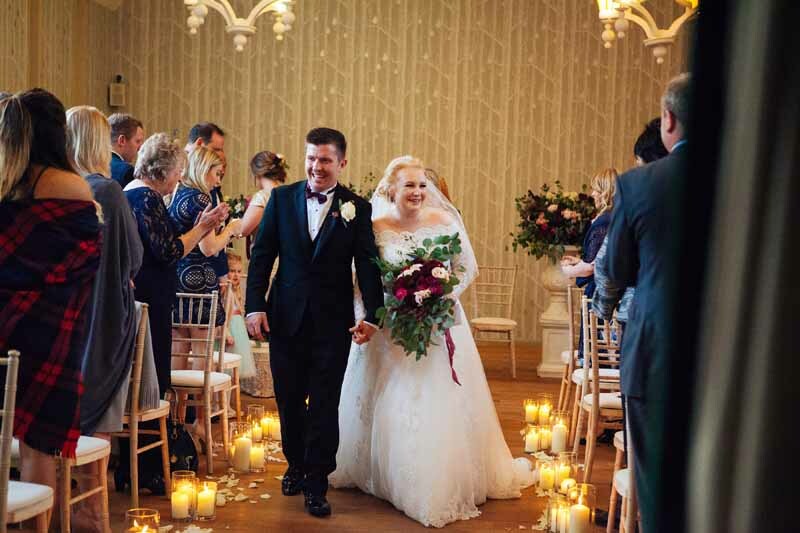 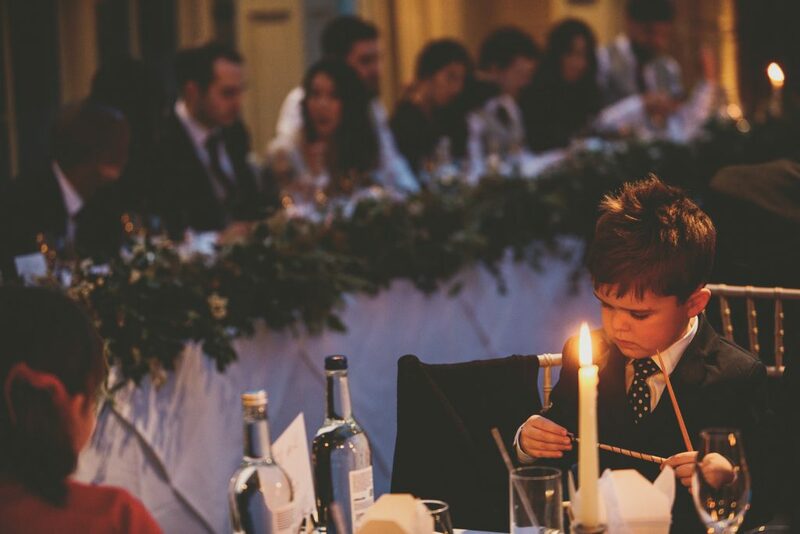 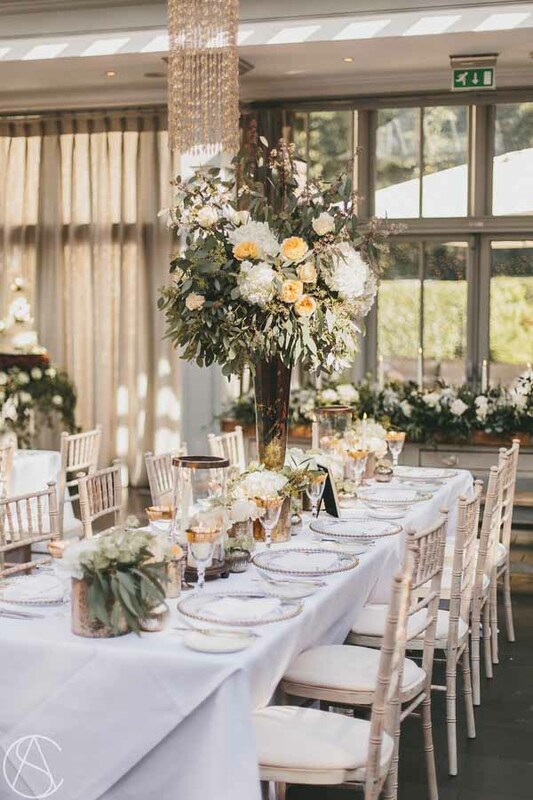 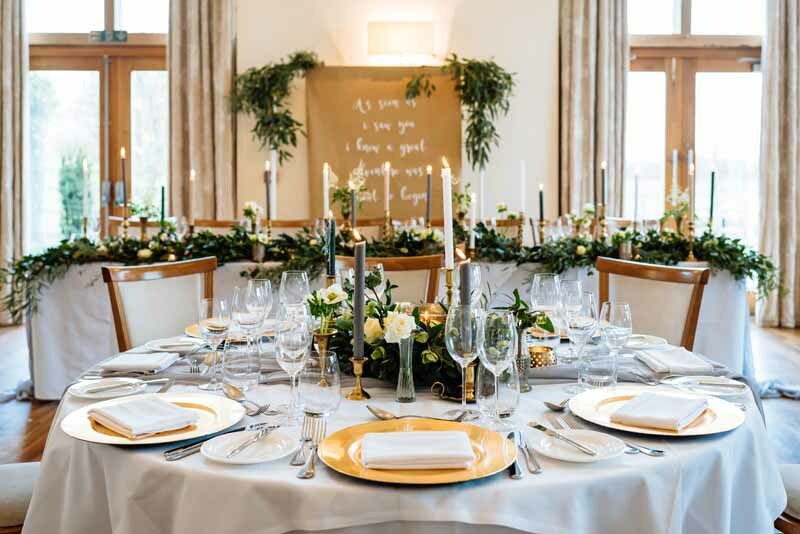 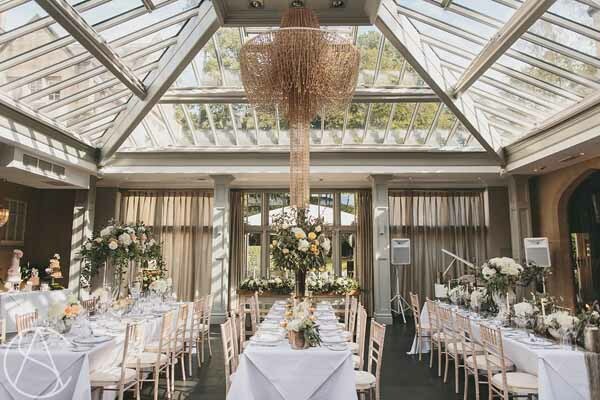 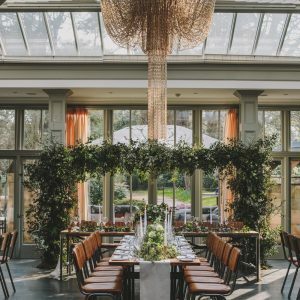 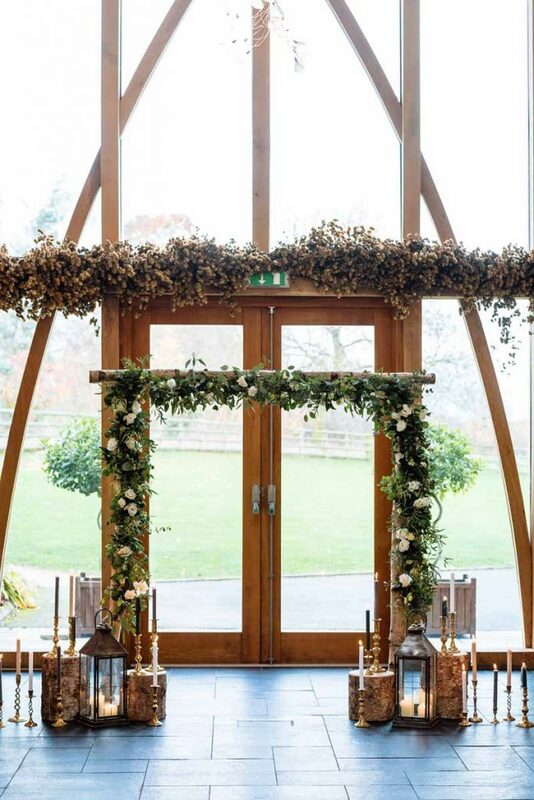 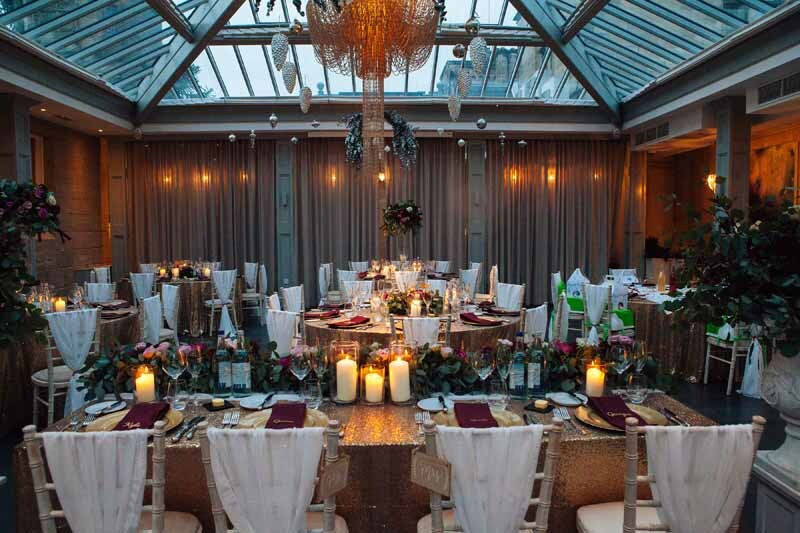 If using the sprig table layout at Hampton Manor make sure you have interest running along the table, use candles and lanterns to add to the romance. 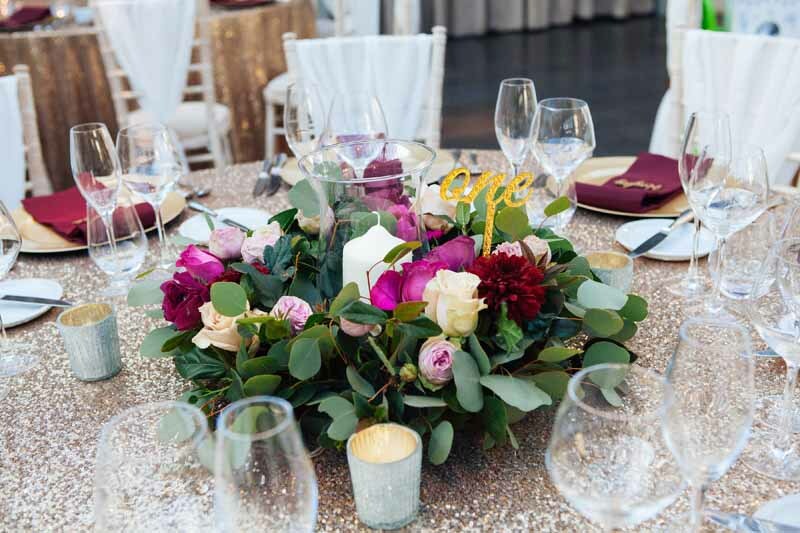 If you are planning a room layout with round tables you could consider using a mix of different centrepieces around the room. 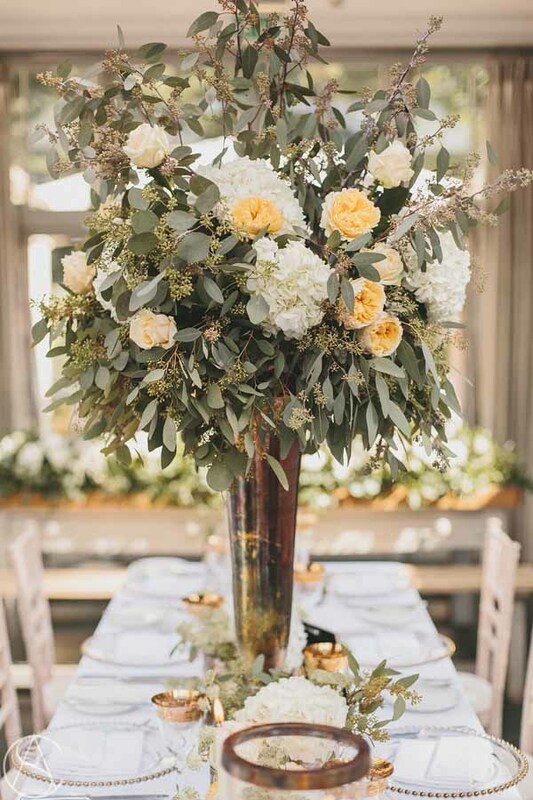 Perhaps a stunning tall bronze vase on a central table and lanterns surrounded by gorgeous blooms on others, with an abundant mix of gold and bronze vases on another. 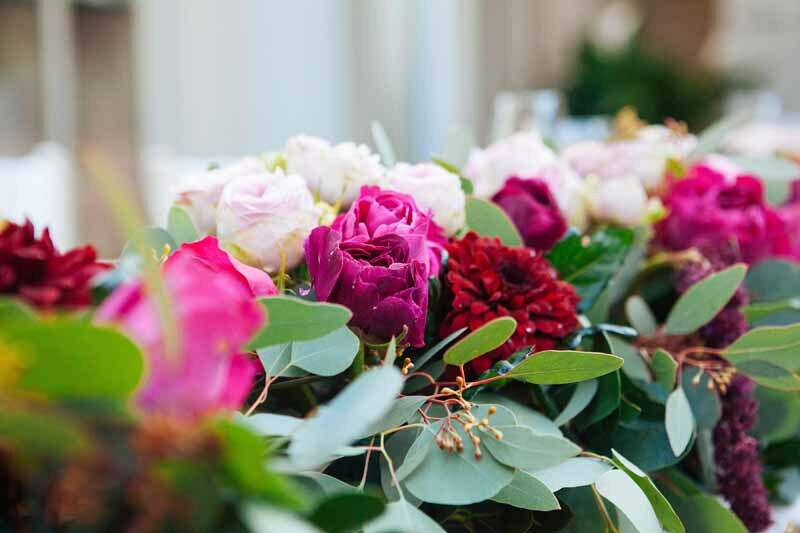 By keeping to the same blooms the look remains cohesive and easy on the eye but becomes a talking point amongst your guests. 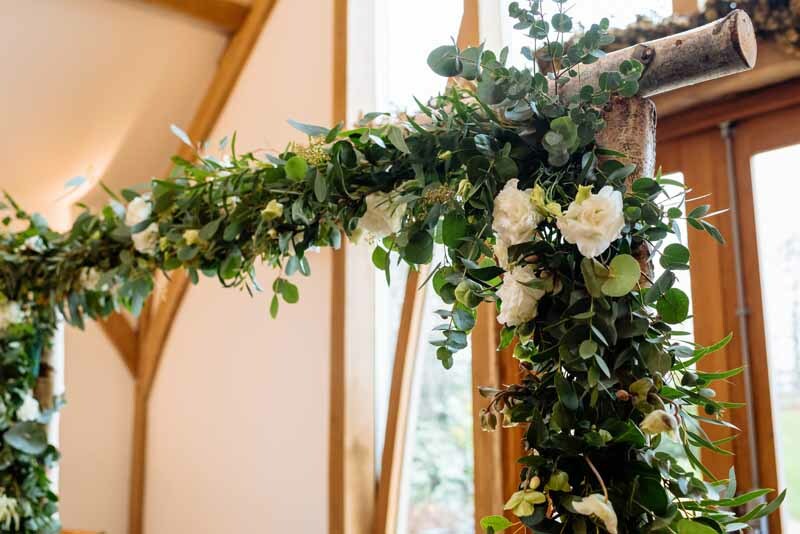 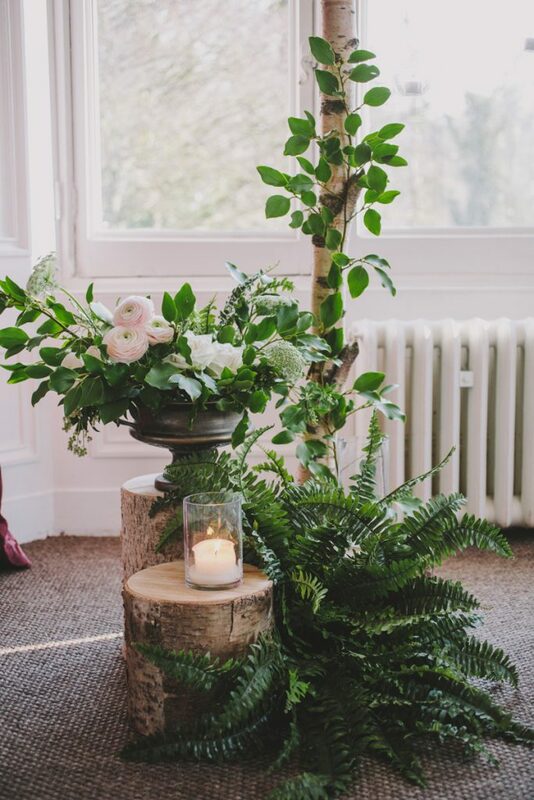 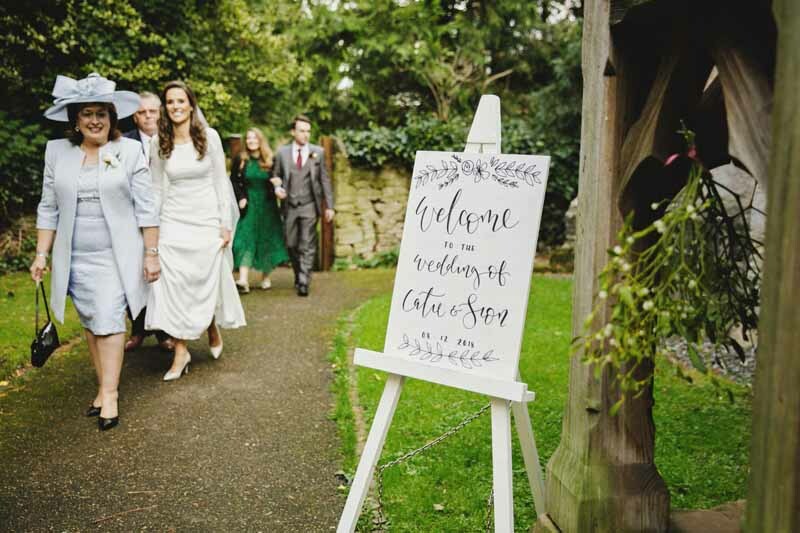 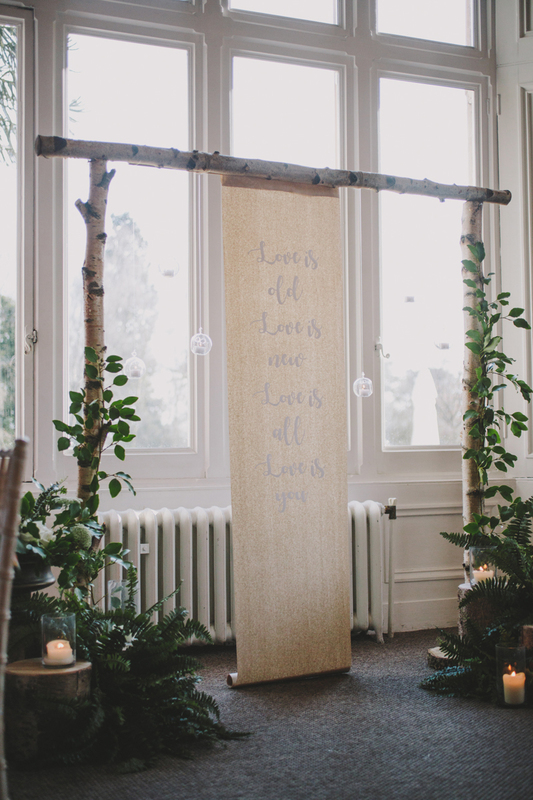 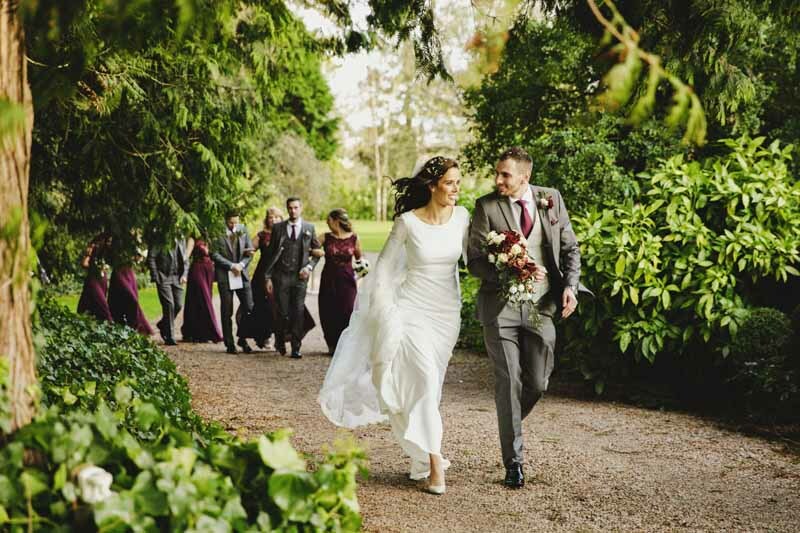 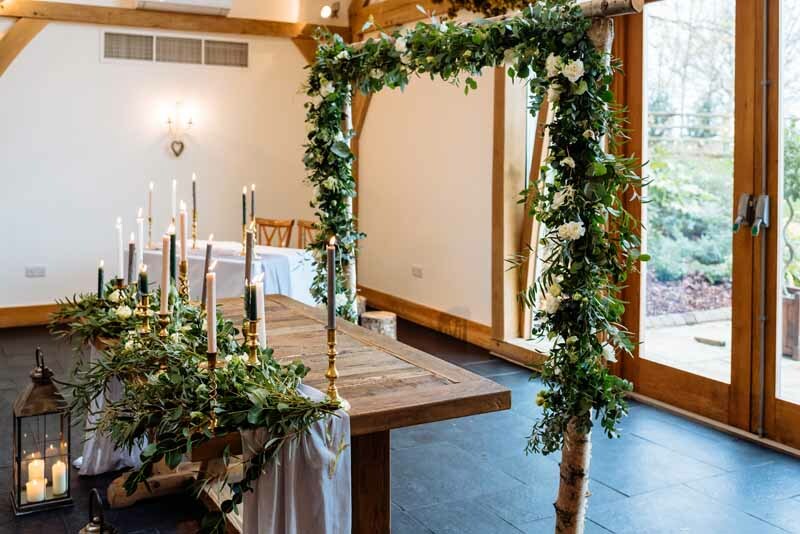 Rustic woodland settings work so well at Hampton Manor and can be started with the ceremony in The Birches. 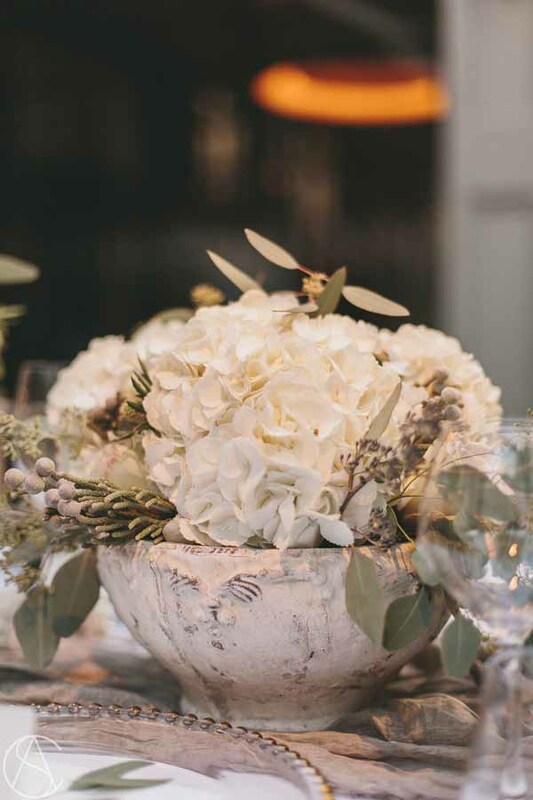 The stone vases and urns create great centrepieces and bring a sense of naturalness to the tables. The stone in the courtyard was our inspiration for this look. 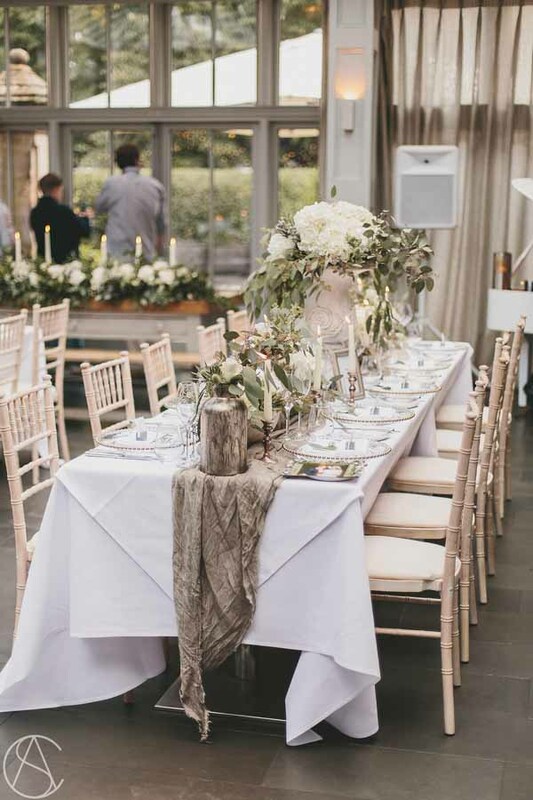 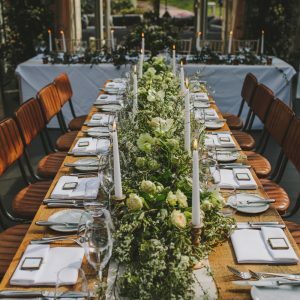 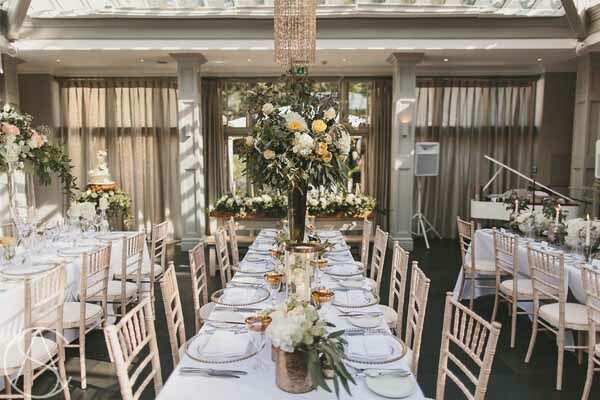 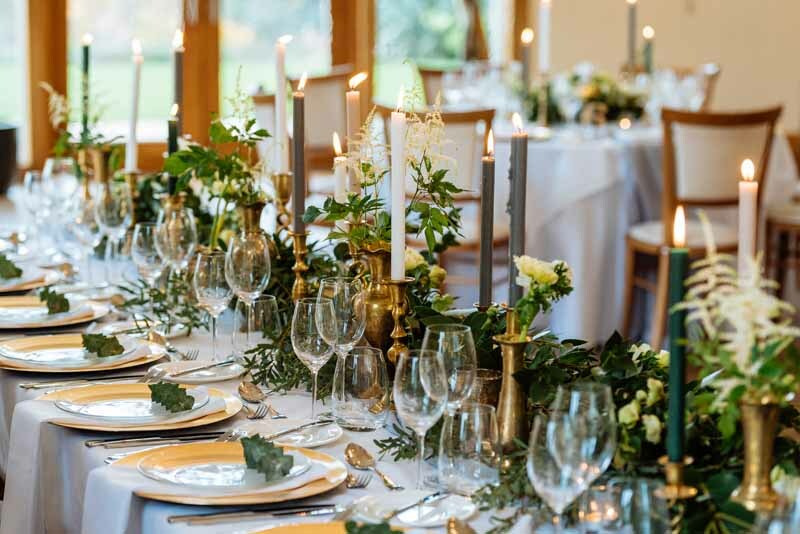 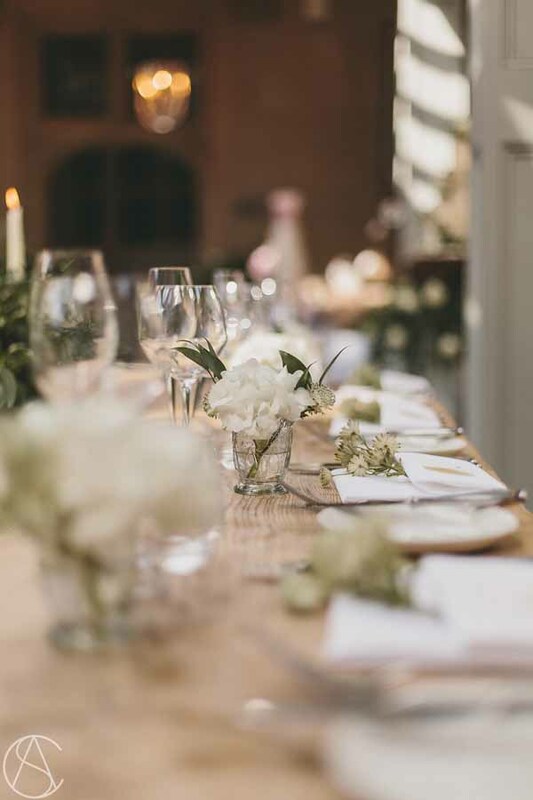 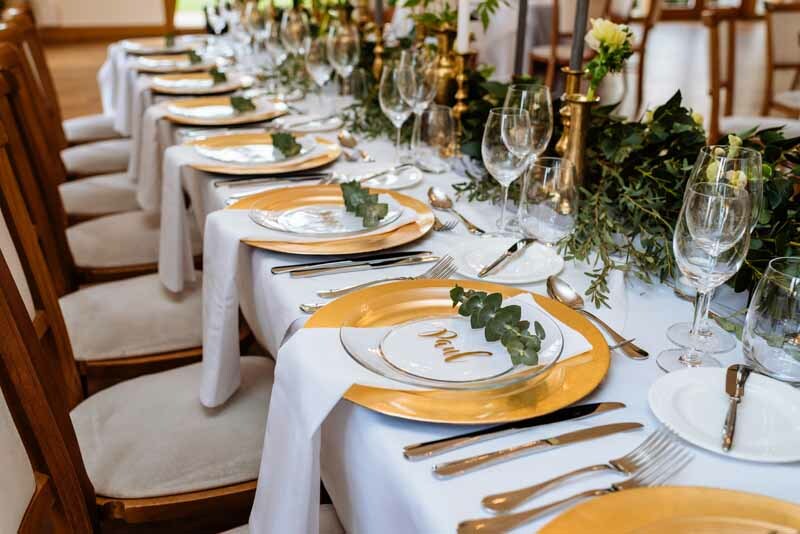 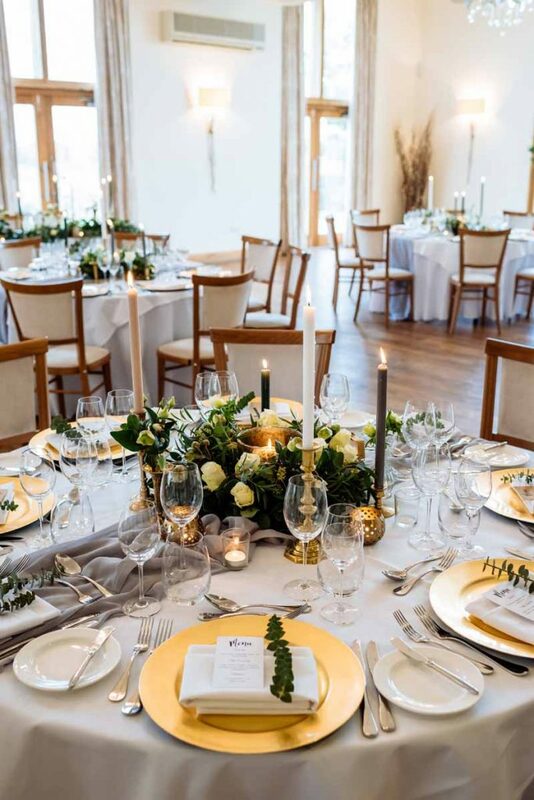 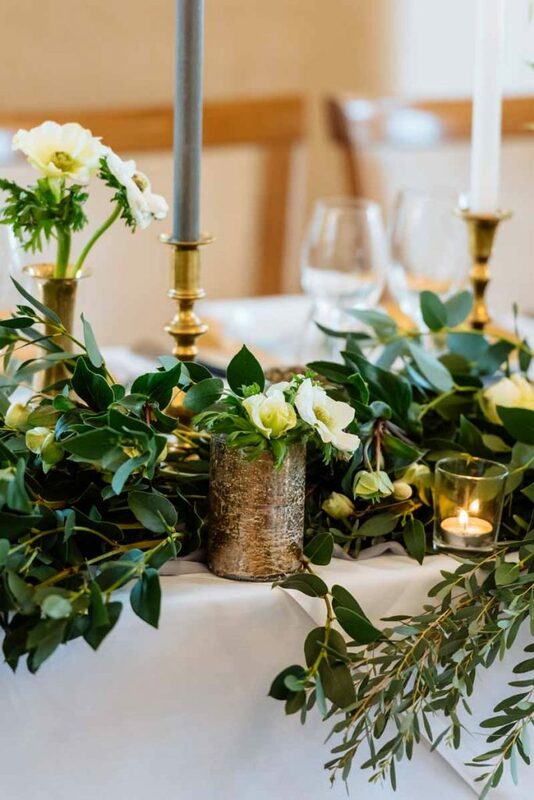 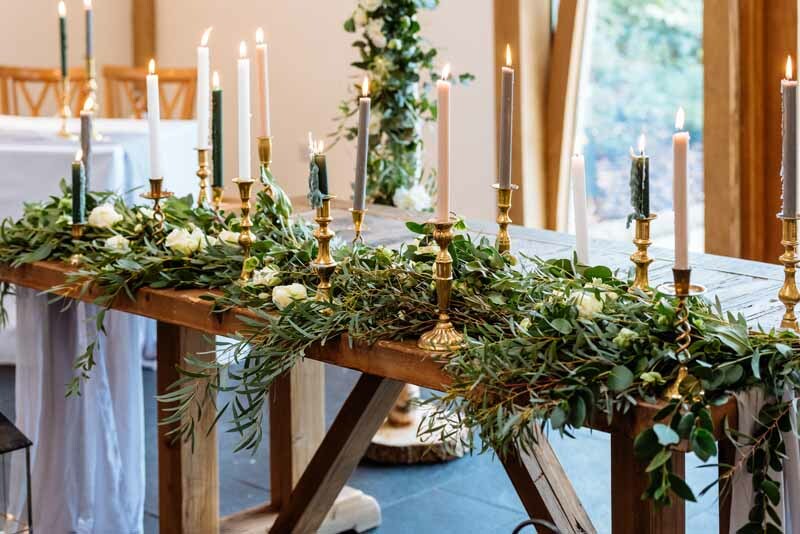 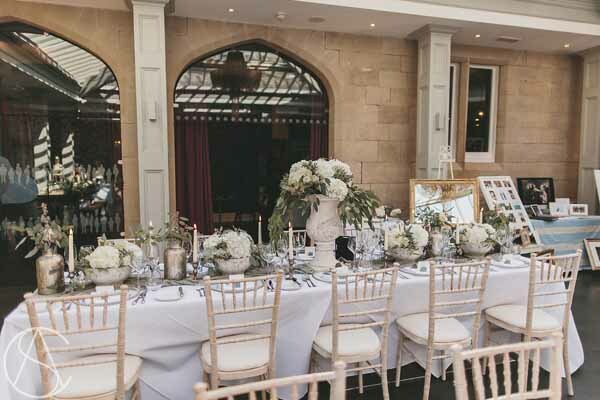 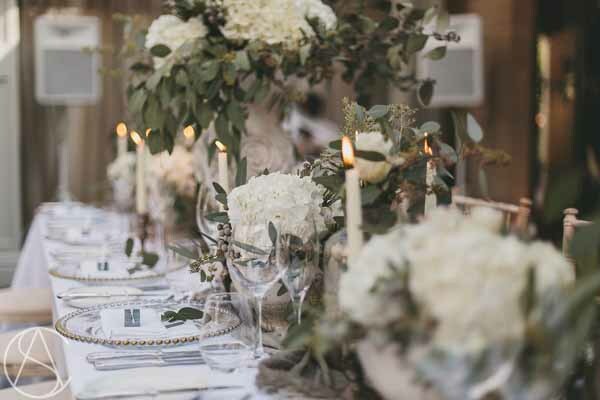 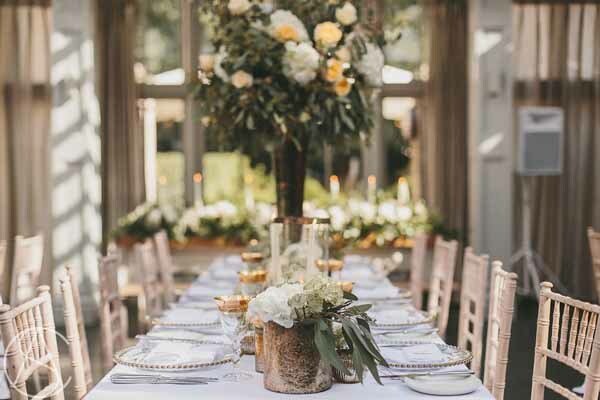 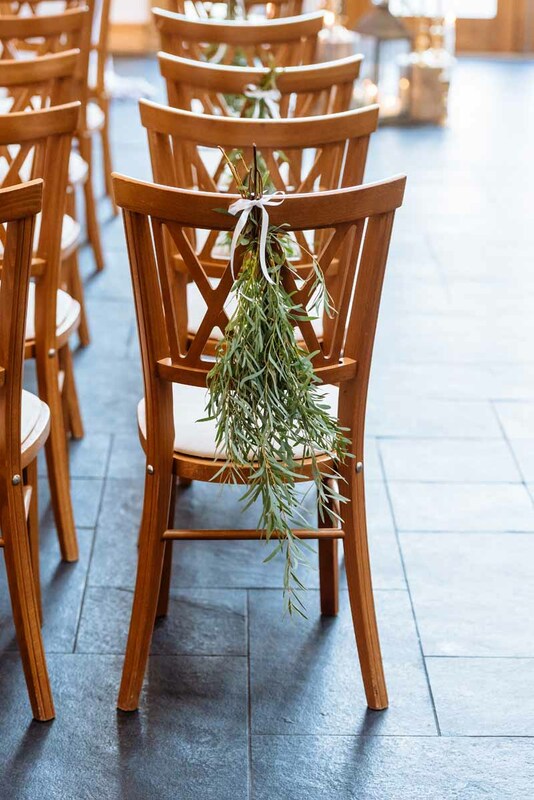 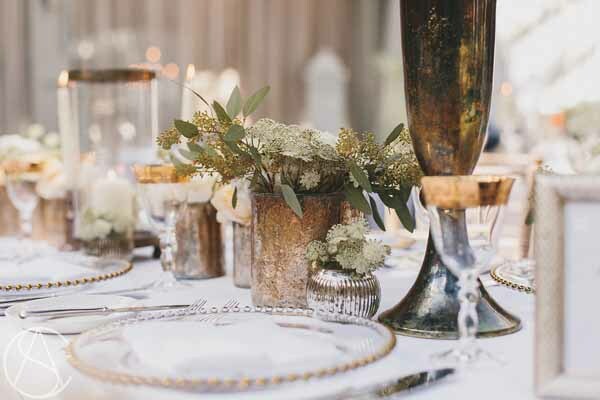 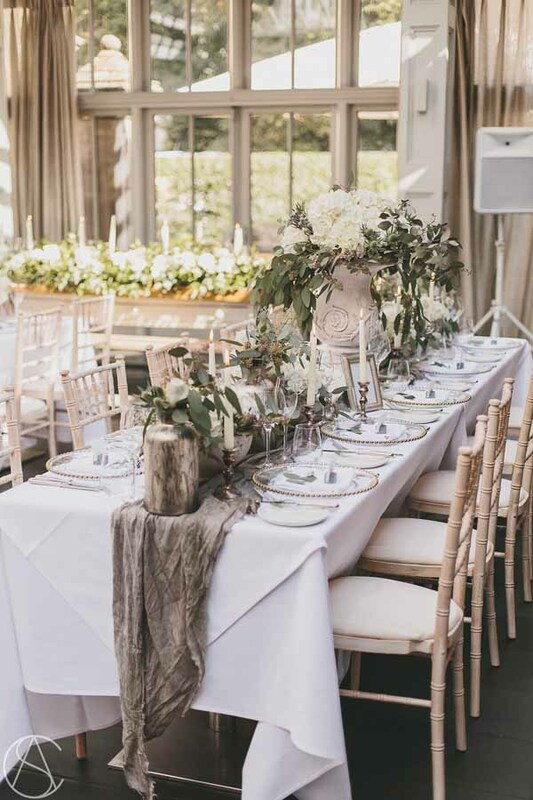 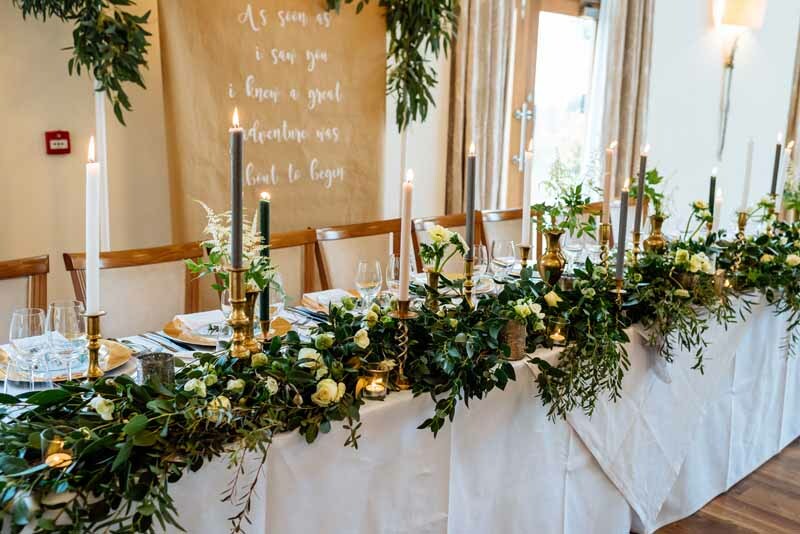 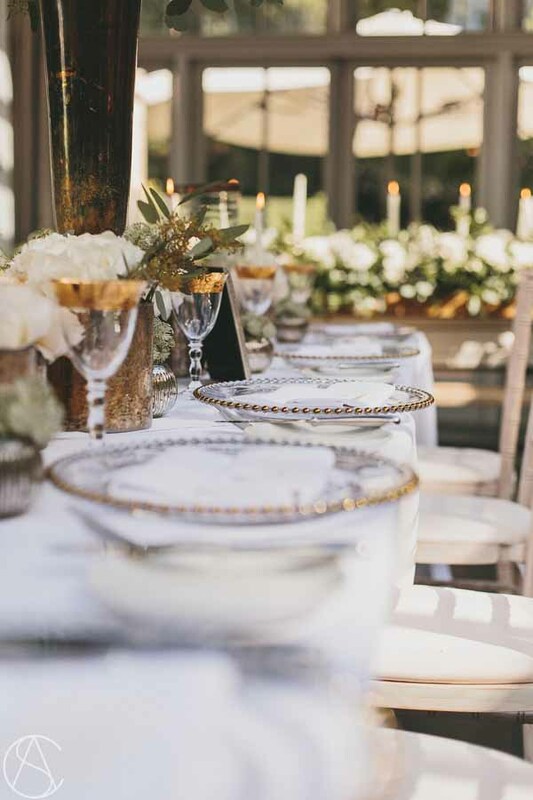 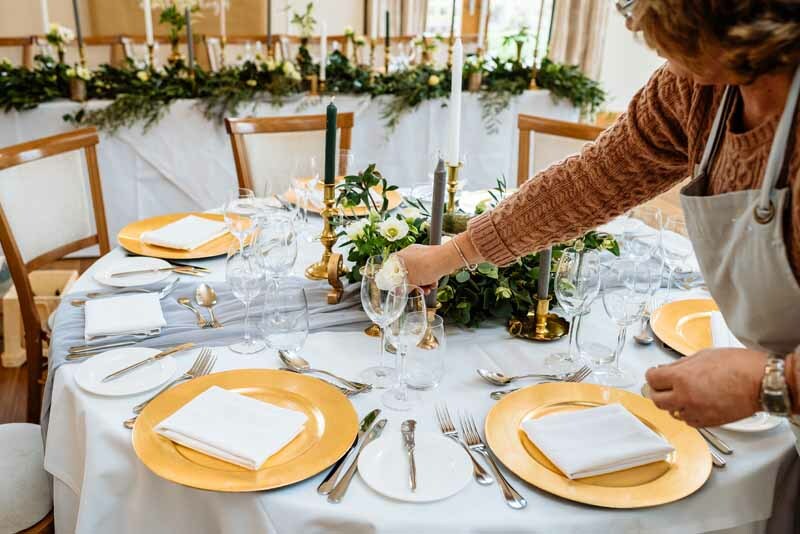 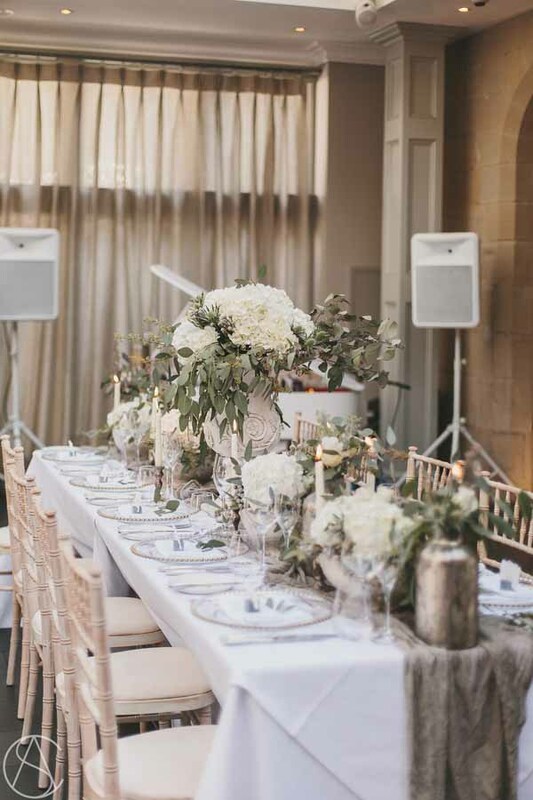 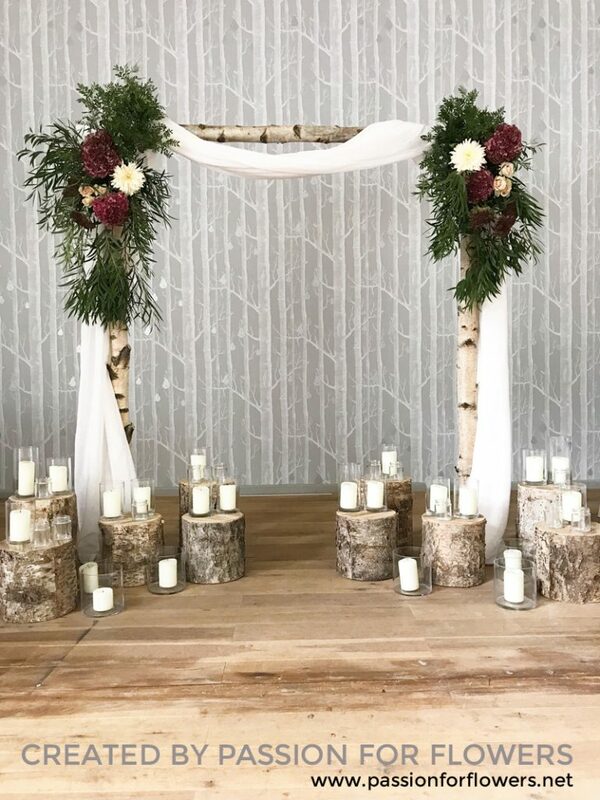 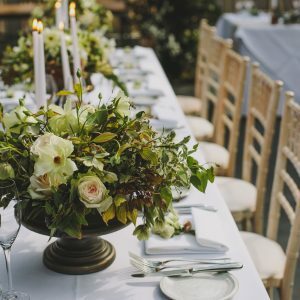 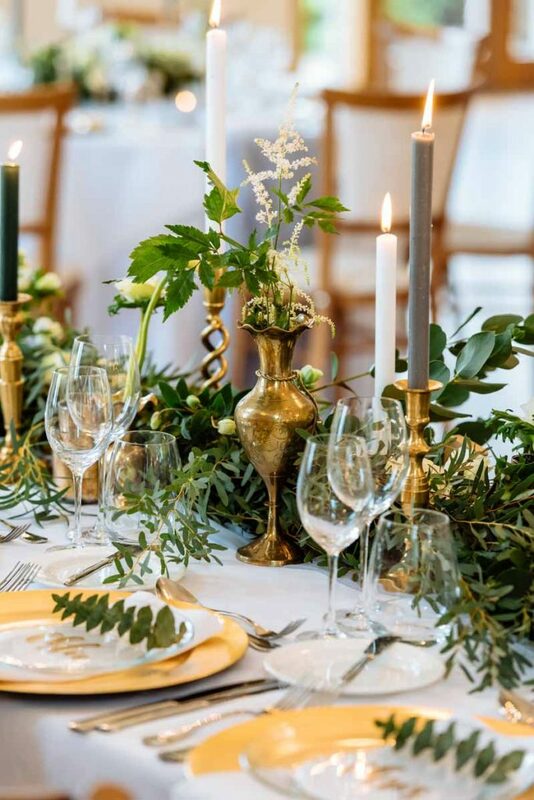 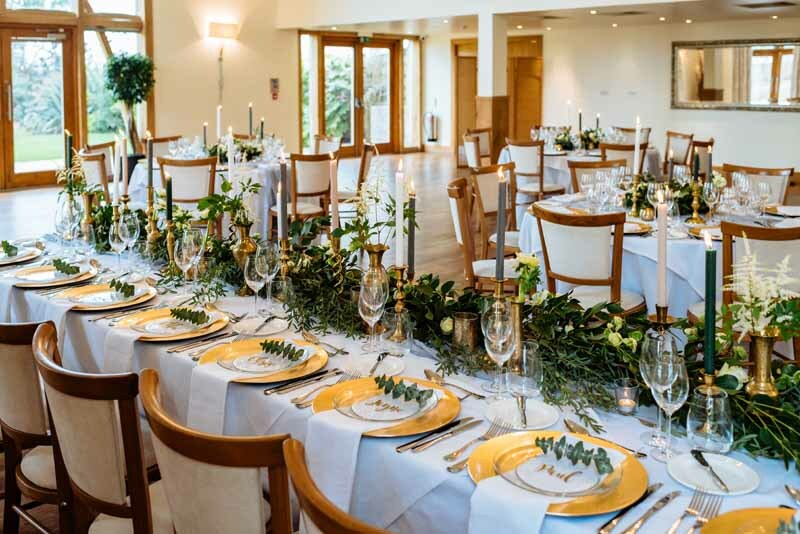 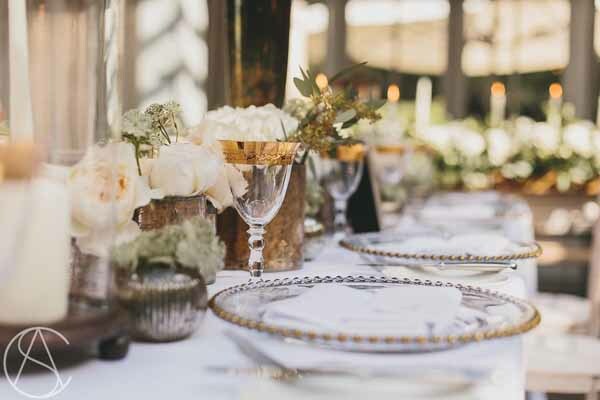 For a winter wedding we have included touches of grey brunia and eucalyptus and added bronze candelsticks and bronze bottles with bloooms along the table. 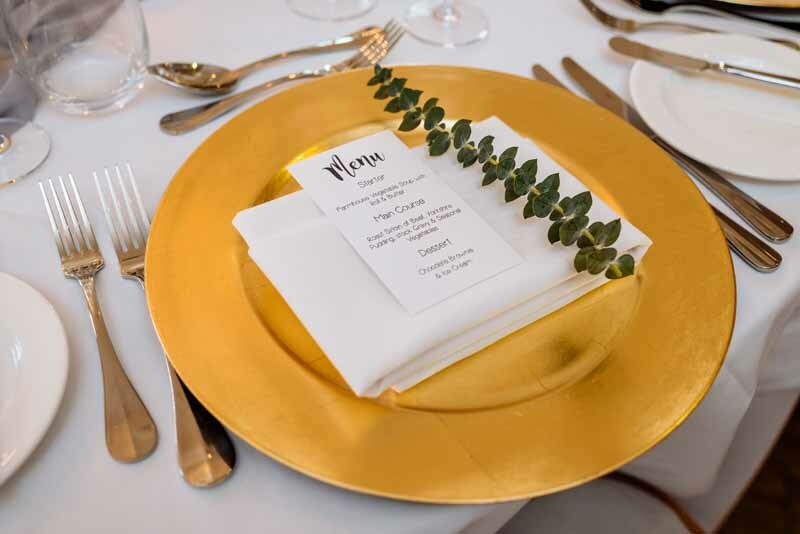 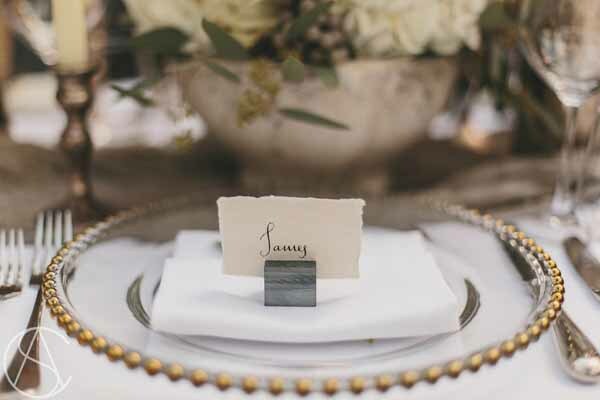 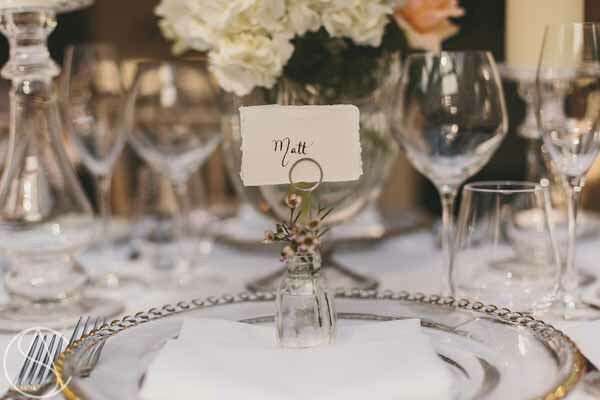 For the place settings a slate place card holder looks just right with torn edge paper and a calligraphy name card. 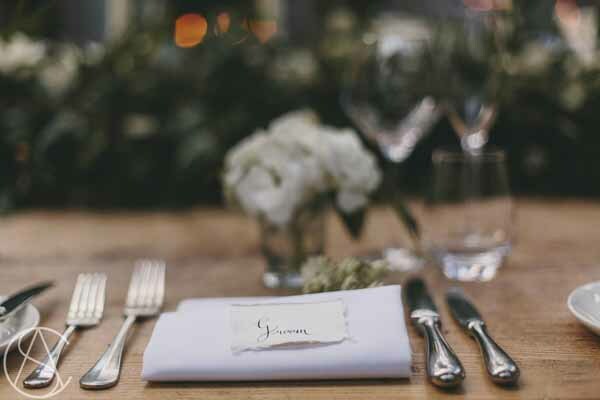 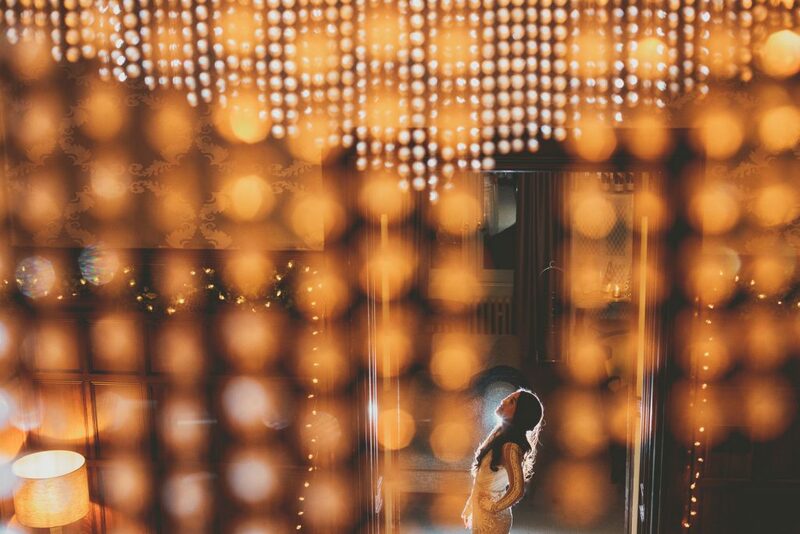 Its the little details that take your wedding from great to amazing. 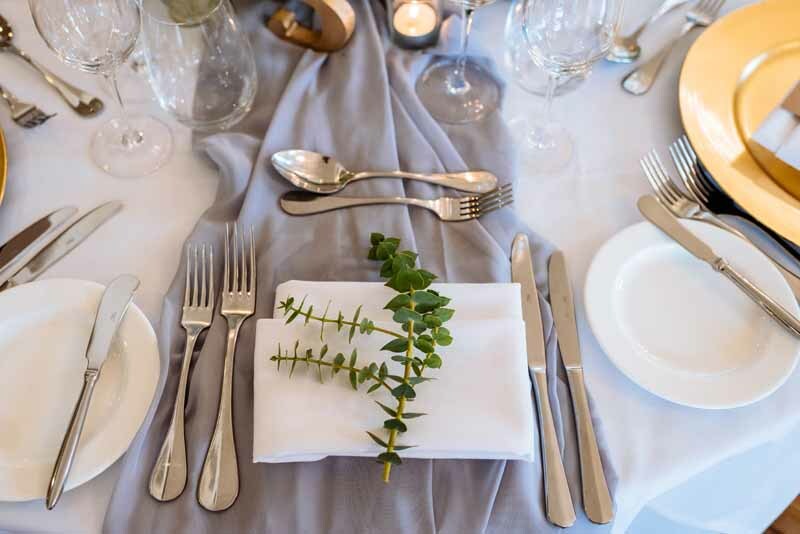 Add texture with a luxe linen grey runner to bring the table to life and glass charger plates to perfect the look. 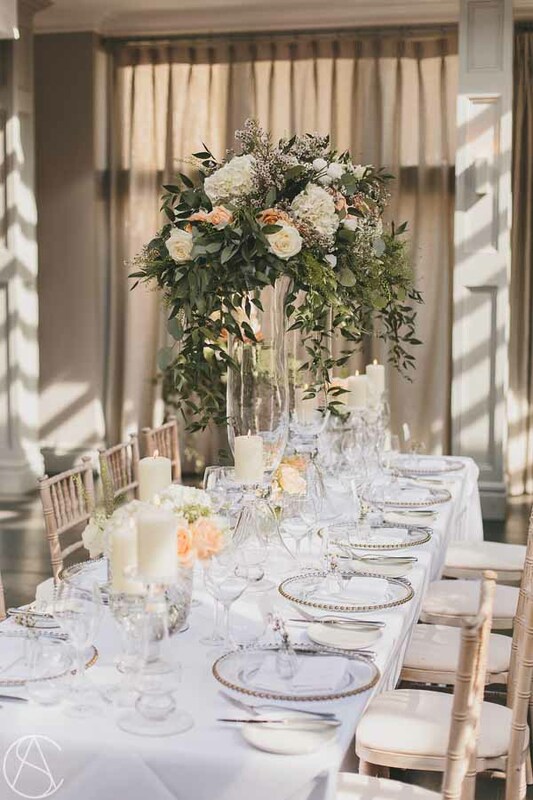 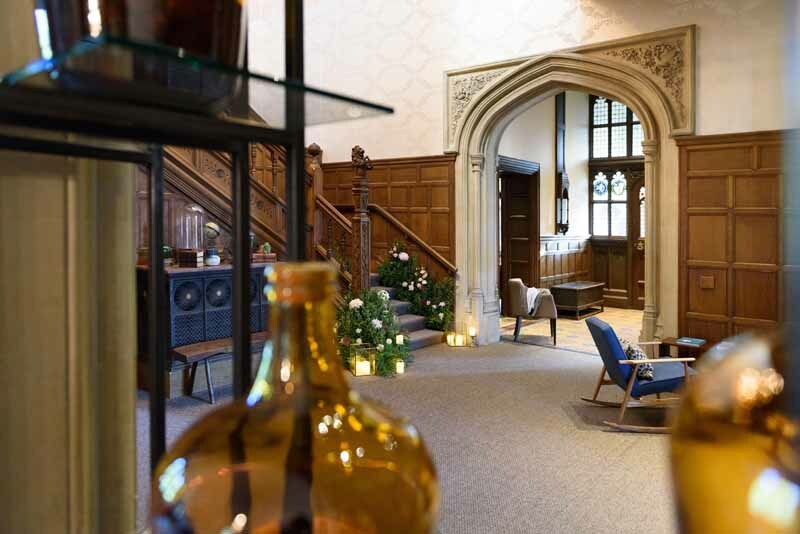 We love elegant tall glass vases and wanted to show one of our latest designs at Hampton Manor. 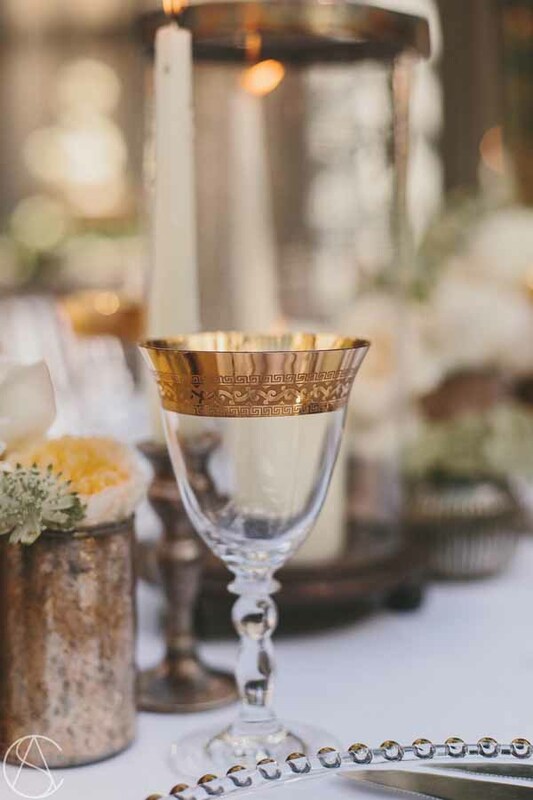 This elevated design could form a centrepiece to a long table design with a mix of smaller glass vases and glass candlesticks running along the table. 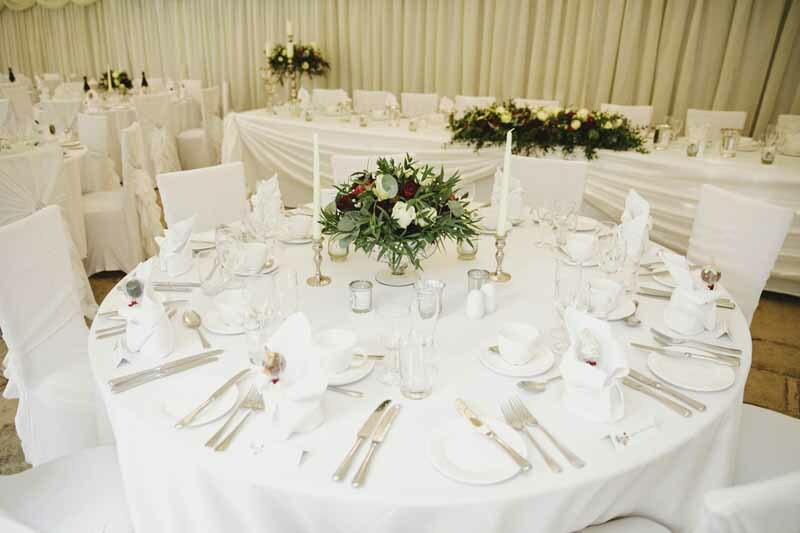 They can also be used to add drama to the Parlour for exclusive use weddings or to create a stunning top table design. 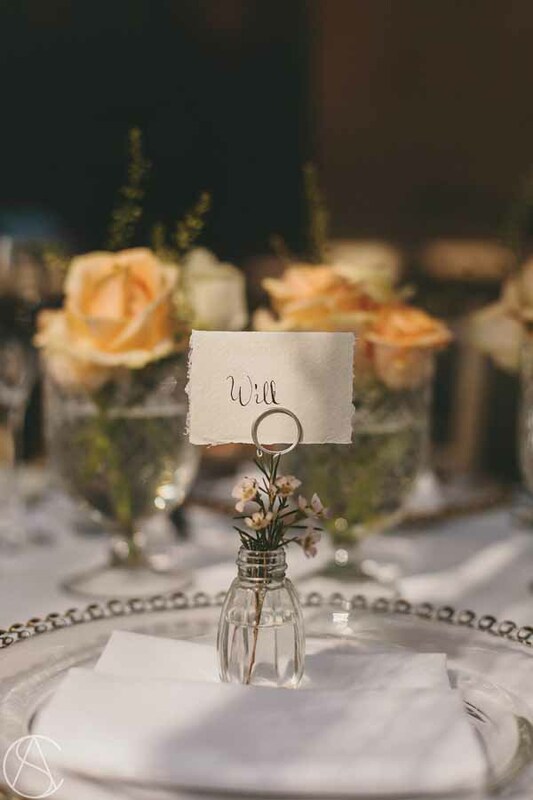 Details for this design included our salt cellar place names with a snippet of waxfower set on a glass charger plate. 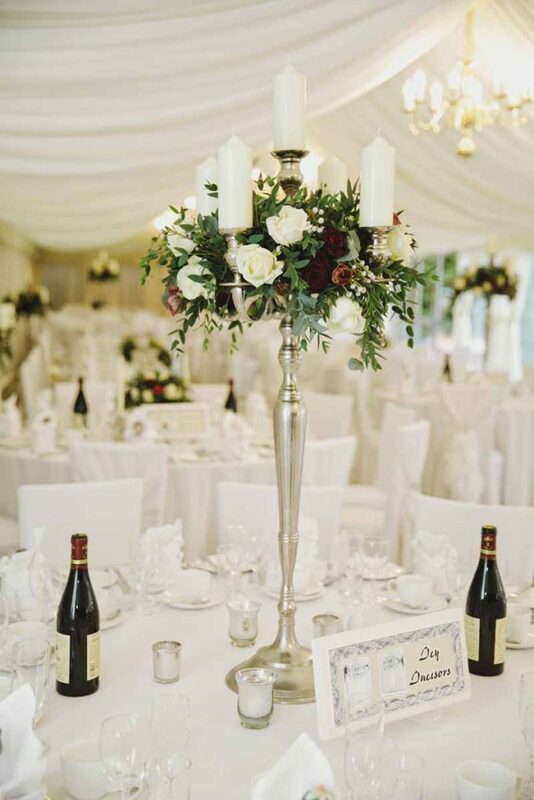 The elegance continues with the glass candle sticks and glass footed vases.